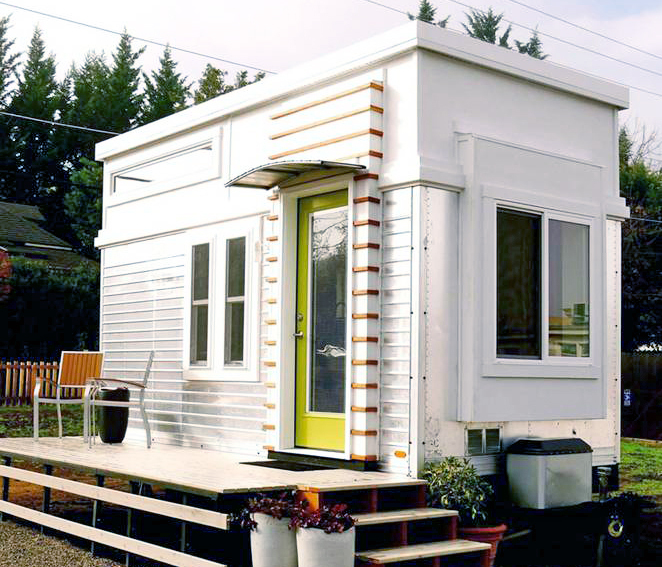 In an era when bigger has always been better, many people are beginning to embrace a mantra of smaller is smarter and are moving into tiny houses on wheels. In fact, it has become a movement, fueling plenty of reality shows. 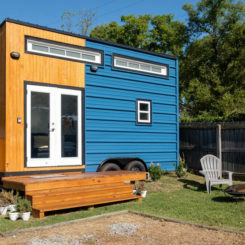 According to the , “America is having a big love affair with tiny houses.” The reality is that the average new home built and the average , according to the census. 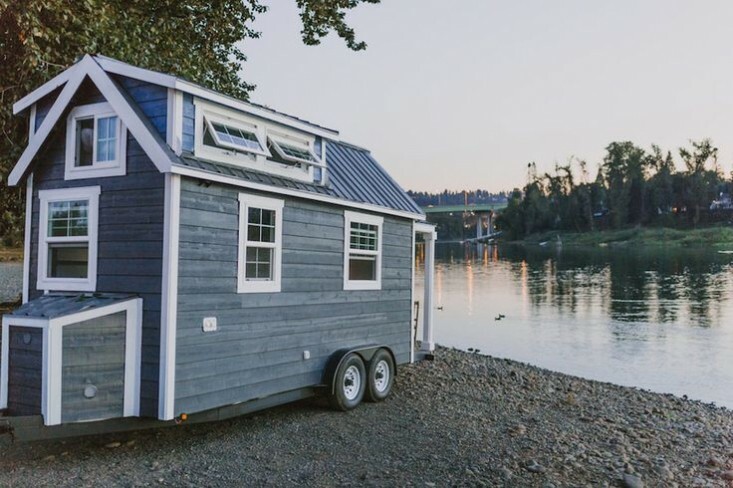 Many people choose to “downsize,” their lives, particularly as they age and their children move out, but the tiny house on wheels concept take things a step further. 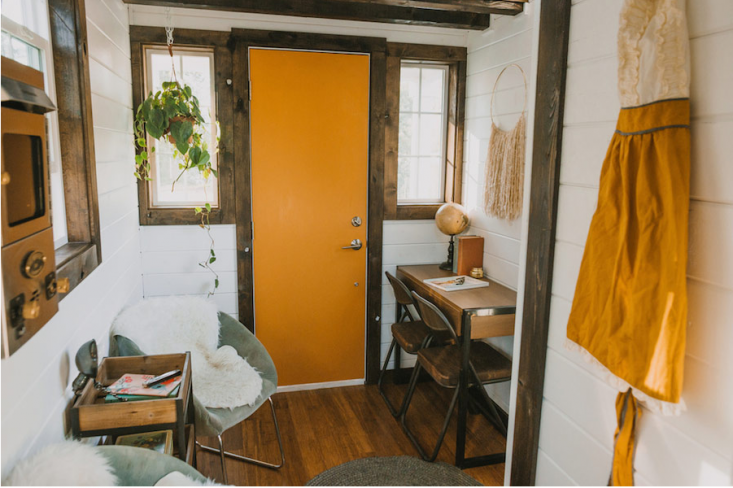 The Post quotes tiny house experts, who cite one main reason for move to smaller homes as the millennial generation, whose student loan debt has made home home ownership difficult if not impossible. 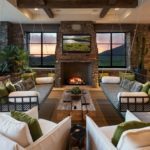 Younger generations are also not interested in the maintenance workload required by a larger traditional home. 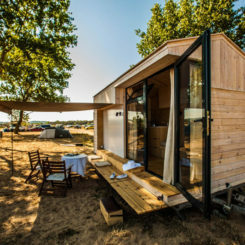 In addition, retirees and people who want the freedom — both financial and logistical — to travel are finding that tiny houses on wheels are the way to go. Thrift. 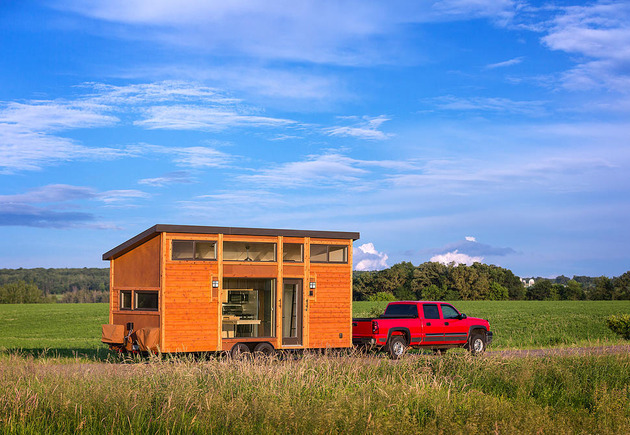 We’ve already mentioned this with regard to millennial, but saving money is often a major factor for the decision to move into a tiny house on wheels. 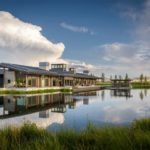 These structures can be had for far less than a traditional house, saving tens of thousands of dollars on a mortgage or on rent. Environmental friendliness. 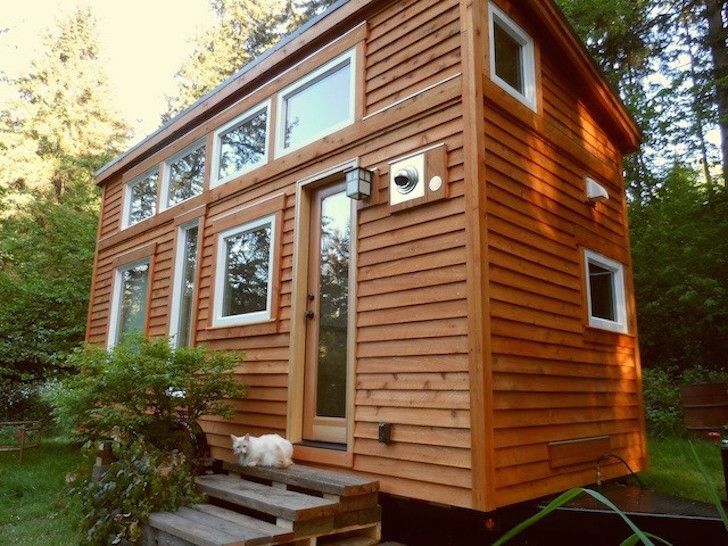 Tiny houses are much easier on the environment than large homes and McMansions, and are energy and resource efficient. Economy of size. 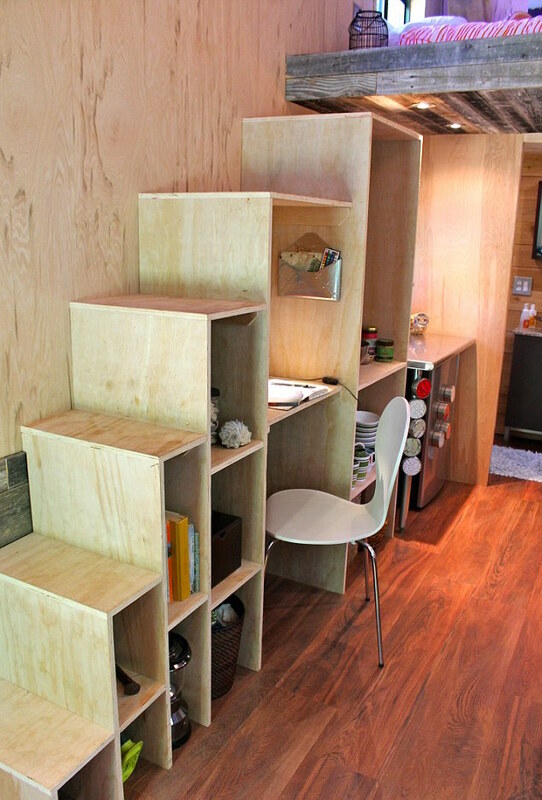 Micro houses eliminate unnecessary and inefficient space, making the most of every square foot. 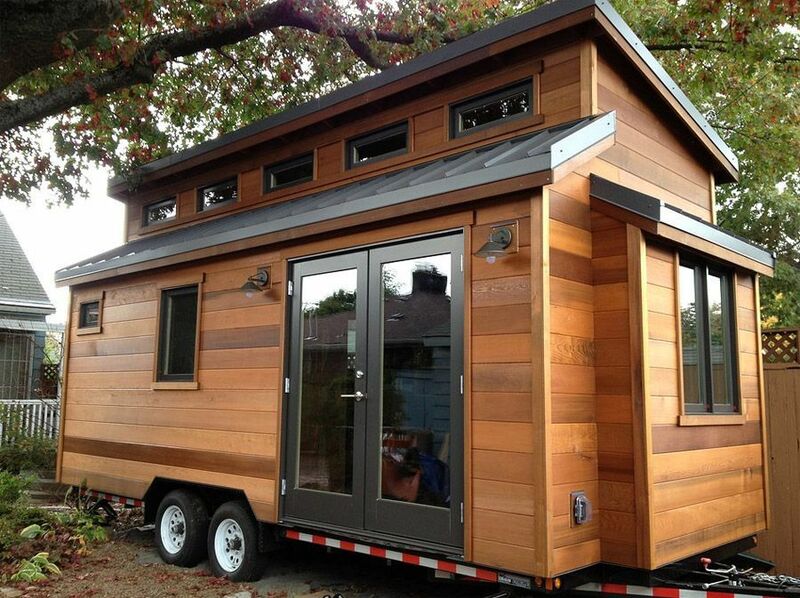 Homeowner can live comfortably without excess belongings. You won’t need a huge lot. 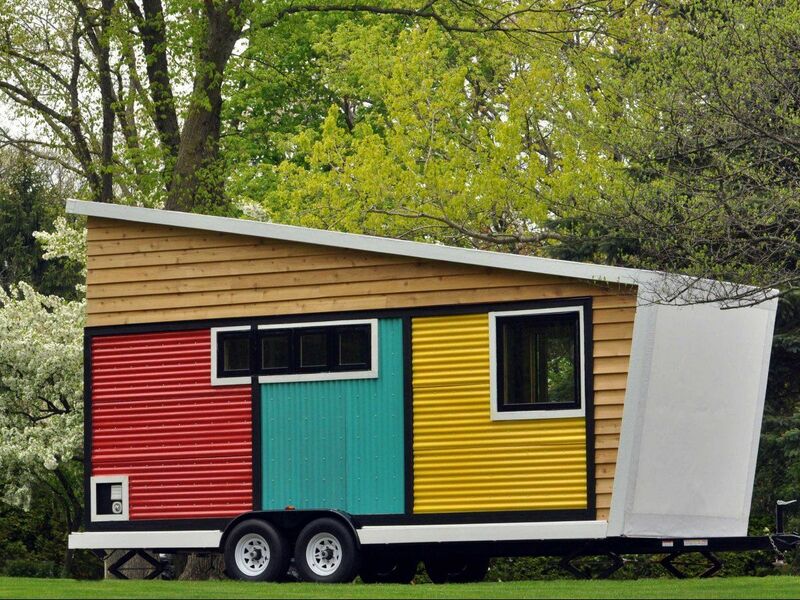 A tiny house on wheels doesn’t need a huge lot. 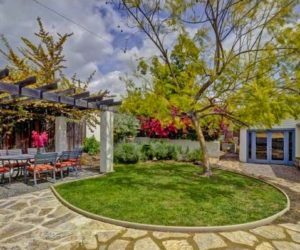 In addition, you can save on property taxes because you have an unimproved lot. If you don’t like where you are, it’s easy and inexpensive to move.
. In a small house the interior mess never truly gets out of hand. Most house cleaning takes a matter of minutes and not hours. Think of the time and effort you can save. Much cheaper to heat and cool. Think of all the unused space you pay to keep a comfortable temperature. 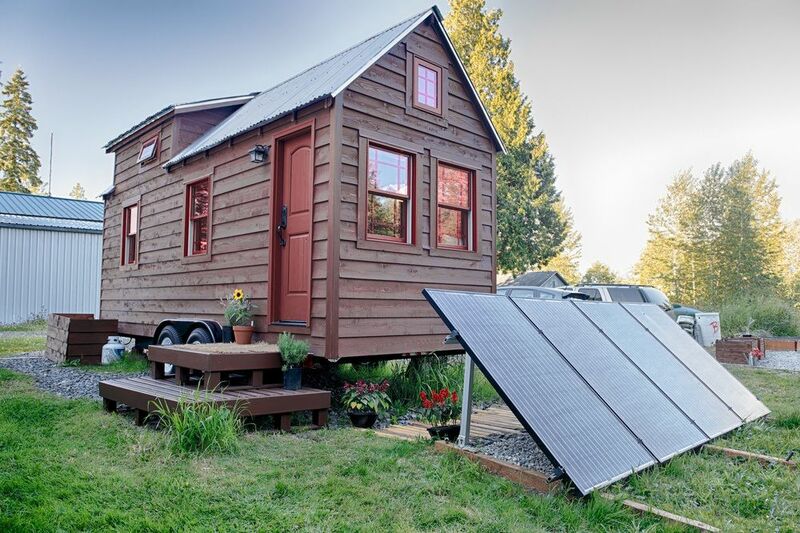 A tiny house will cost much less to heat or cool. Economical from a decorating perspective. There isn’t all that space you have to fill up. You only have to buy the furniture you absolutely need, which means you can invest in higher quality pieces. 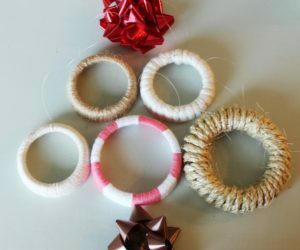 Decorating is much easier and more basic in a smaller environment. 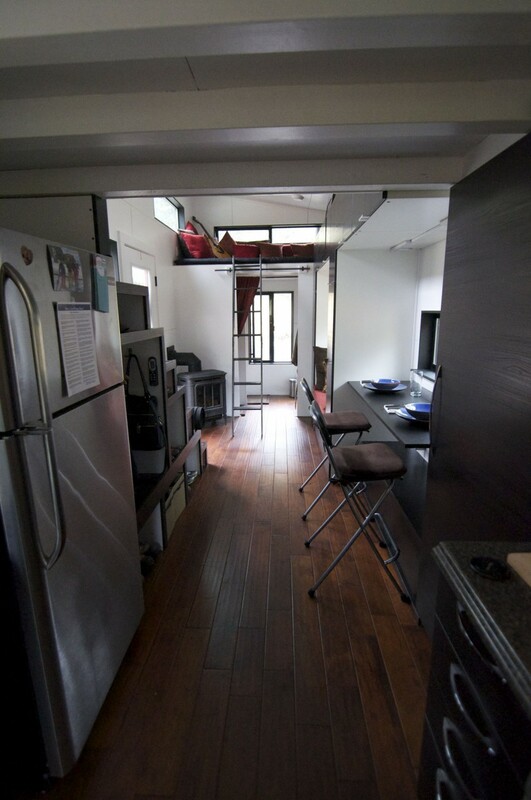 Despite everything you read online, living in a tiny house on wheels also has disadvantages. 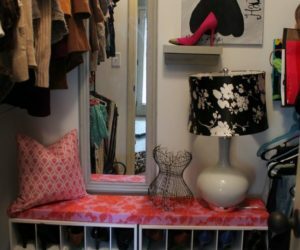 As the Post points out, some bloggers glamorize small-house living, glossing over the details that can be difficult for some people to handle. 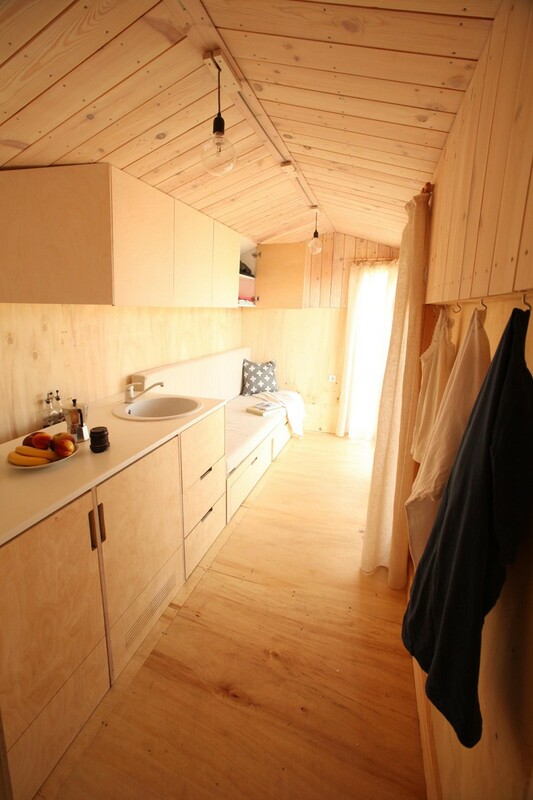 and identify the top disadvantages that homeowners may encounter when trying to switch to living in a micro house. Illness or Injury. 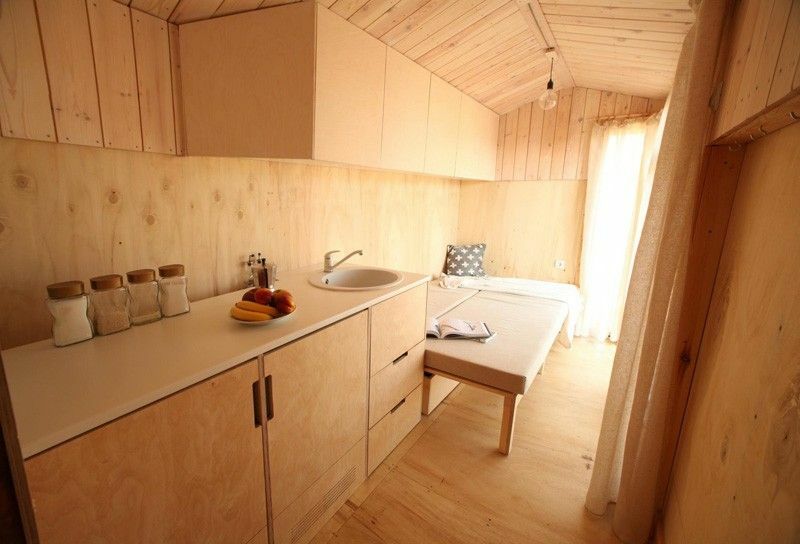 If you become sick or injures, life in a tiny house can be uncomfortable even impossible. 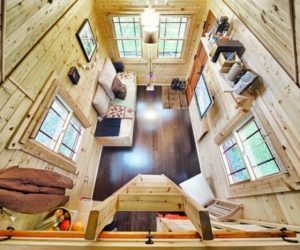 While some retirees may great about tiny house living, scaling the ladder to a sleeping loft can be a insurmountable issue for some people. Even a temporary back injury can make this unpleasant. 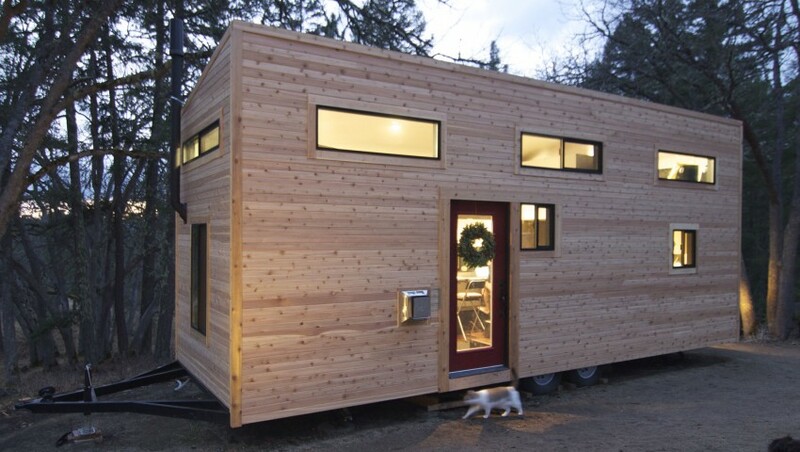 If your tiny home is in a remote location, getting emergency hep can also be a problem. Building codes. 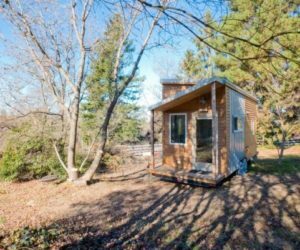 Every community or area has its own building codes and local zoning rules, and in most cases, the laws have not caught up with the tiny house movement. 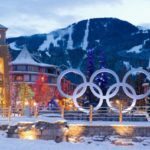 Many towns don’t know what to do abut the issue, so you might not legally be able to park your home anywhere, even if you can do it logistically. Claustrophobia. 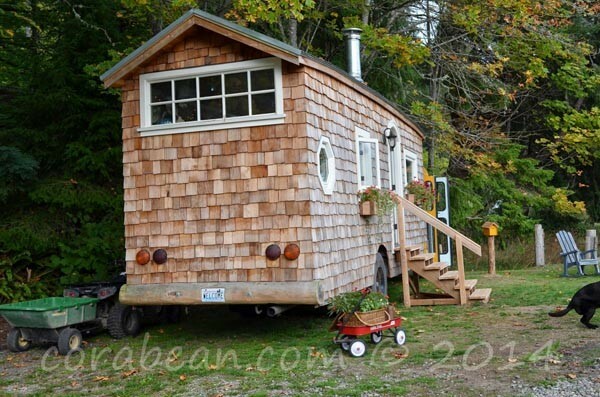 If you really have a problem with confined spaces ma tiny house on wheels may not be a good choice. Depending upon where you are located, the only way to ease cabin fever is to head for the outdoors or a public place. Public opinion. 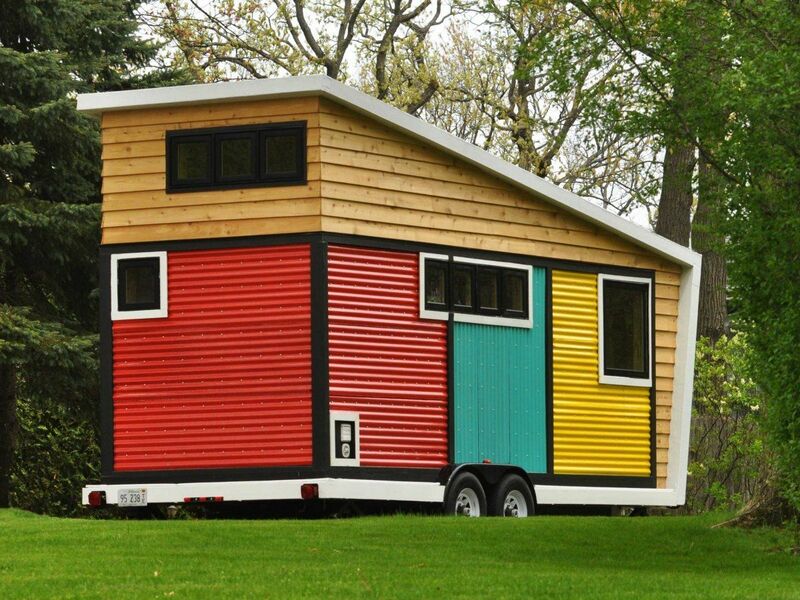 No matter how much you love living in a tiny house on wheels, you will have friends, family — and even strangers — who will make negative comments about your choice. Hard work. 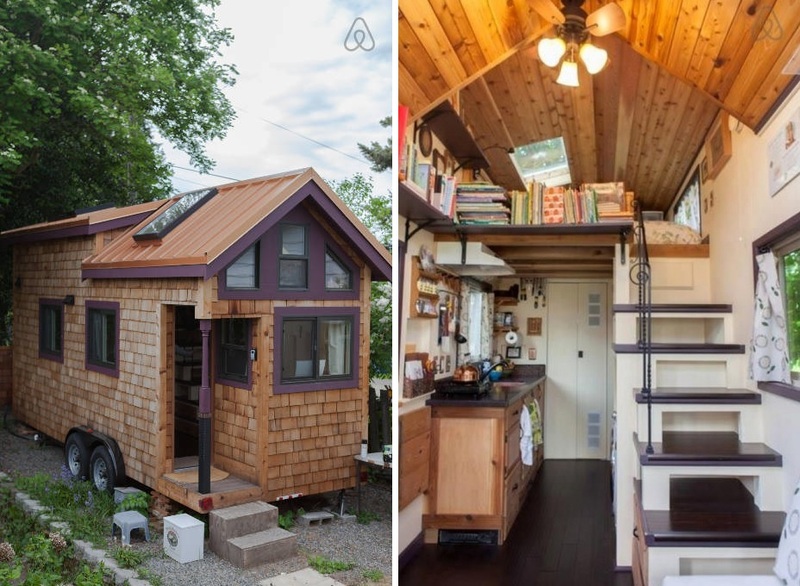 No matter how you slice it, living in a tiny house is always hard work. 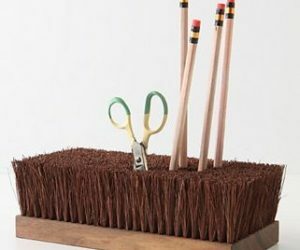 here are always little projects that need finishing or fixing. You never know when you might need to make an upgrade or move the house to a new location. 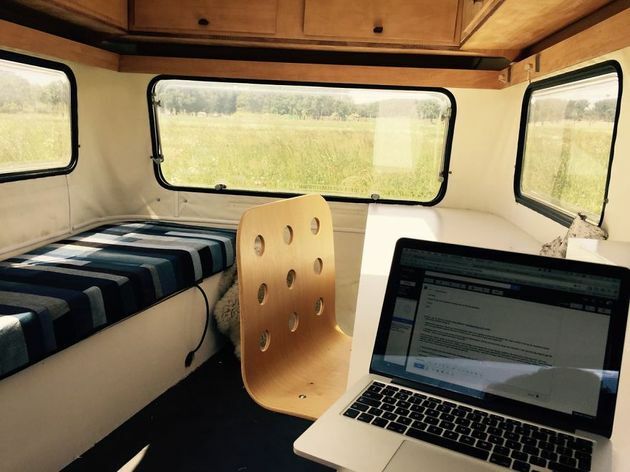 No home office space. If you work for yourself, this can become a serious issue. No personal space. 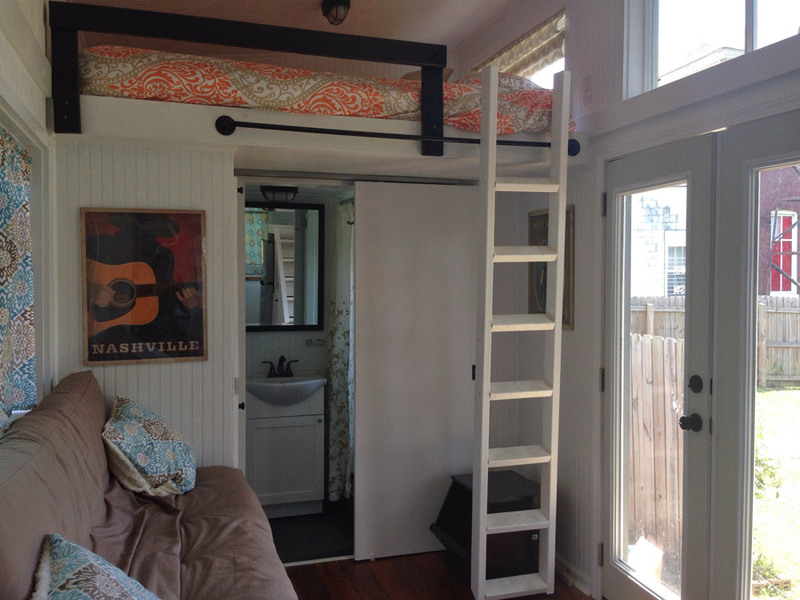 This isn’t a problem if you live alone, but for couples who go the tiny house route it can be difficult…no stomping off to another room after a spat! Small kitchen. A confined kitchen can make cooking from scratch regularly difficult. Bathroom woes. Composting toilets are not for everyone. Neither are very basic flush models. Storage space. 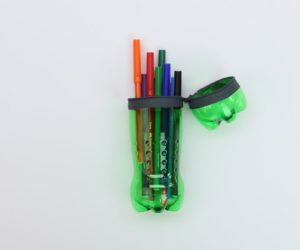 It’s an issue for everyday items and bulk purchases. 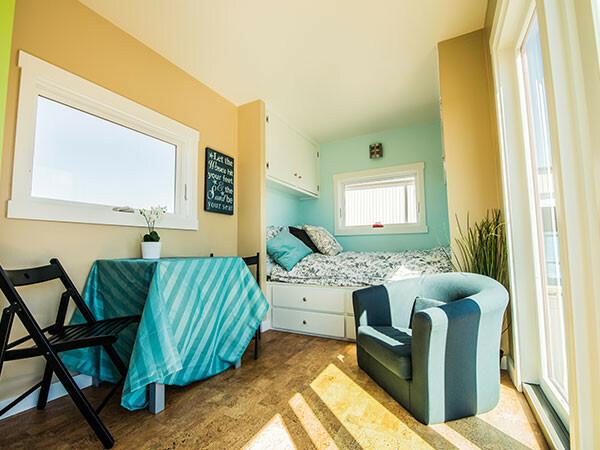 If you’re thinking of switching to loving in a tiny house on wheels, there are plenty of resources available, and examples of all sorts. 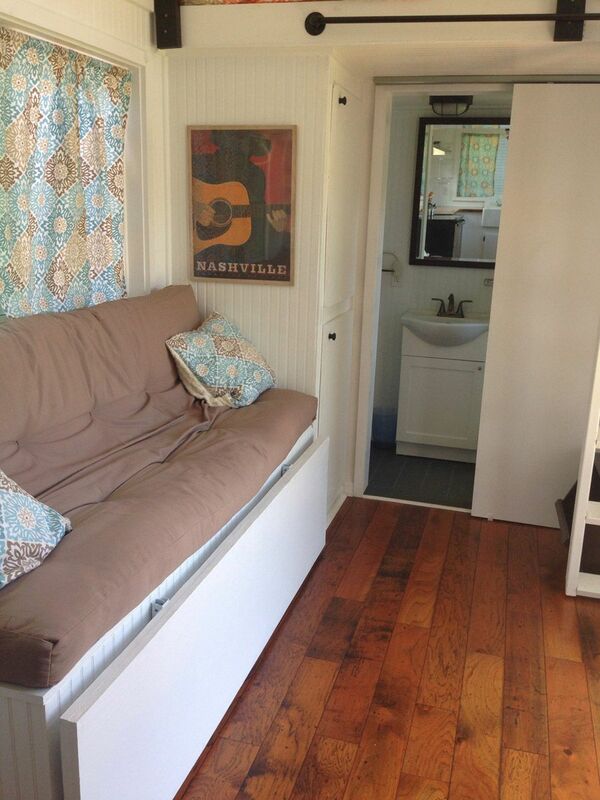 You can also find plenty of listings for a tiny house on wheels for sale. 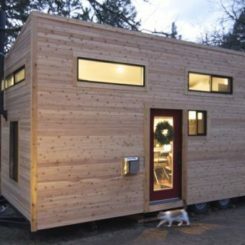 If you decide to go the DIY route, there are also many tiny house plans you can view or purchase. 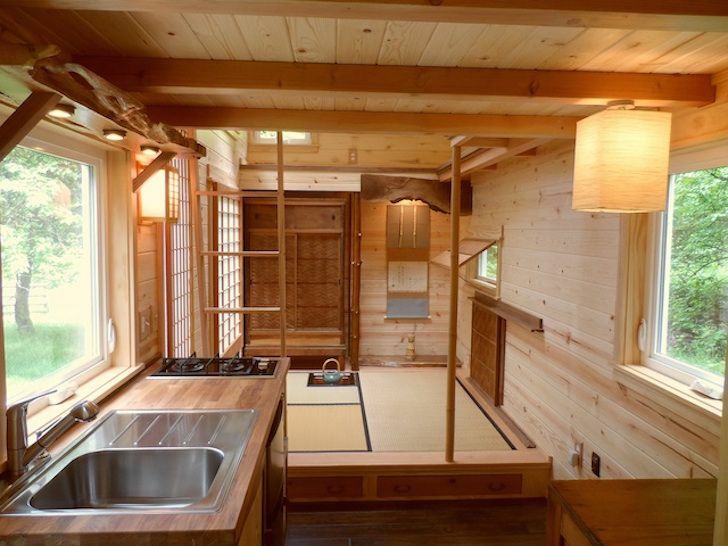 Or, maybe you’ll want to design your own tiny house plans! 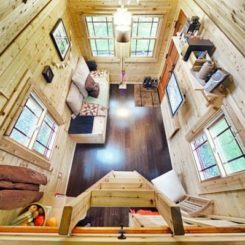 More visually interesting than the average tiny home, this includes many interior innovations that make the most of the small space. There’s plenty of natural light, which is very important to keep a small space from seeming, well, too small. Inside, the light, warm wood helps give the house an airy feeling. 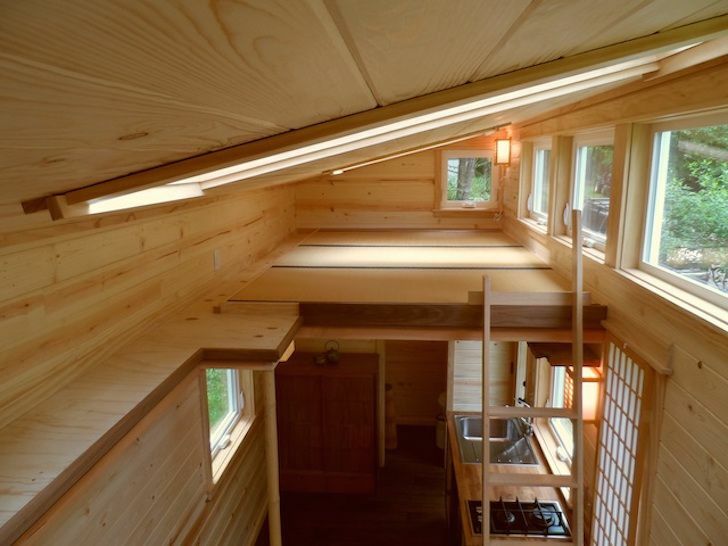 The structure is insulated with blown-in blanket insulation and has radiant floor heating. 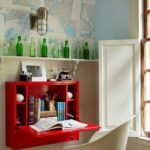 Modular furniture keeps the living area versatile and the kitchen has a good amount of work space, and a cool-looking row of small bins under the window that is as much décor as it is storage. 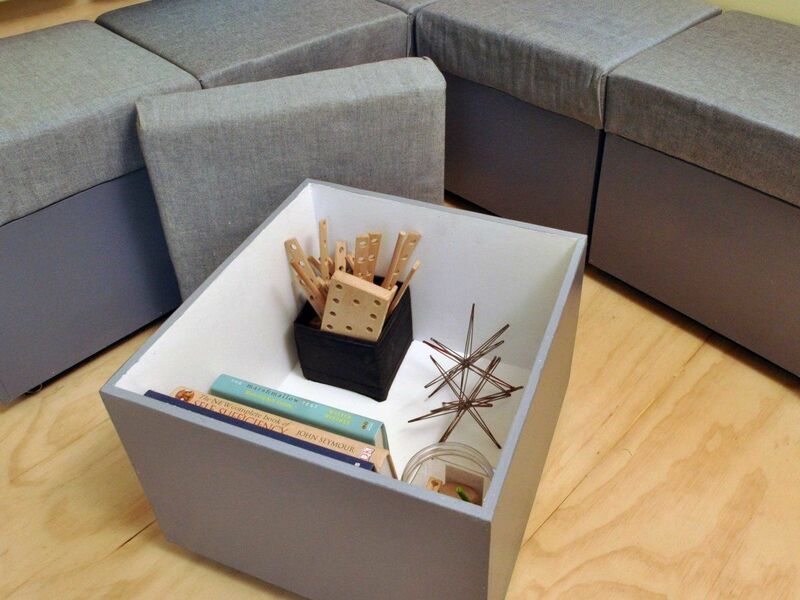 A fold down table can be used for dining or as a desk, and the concealed pantry keeps the design lines clean. 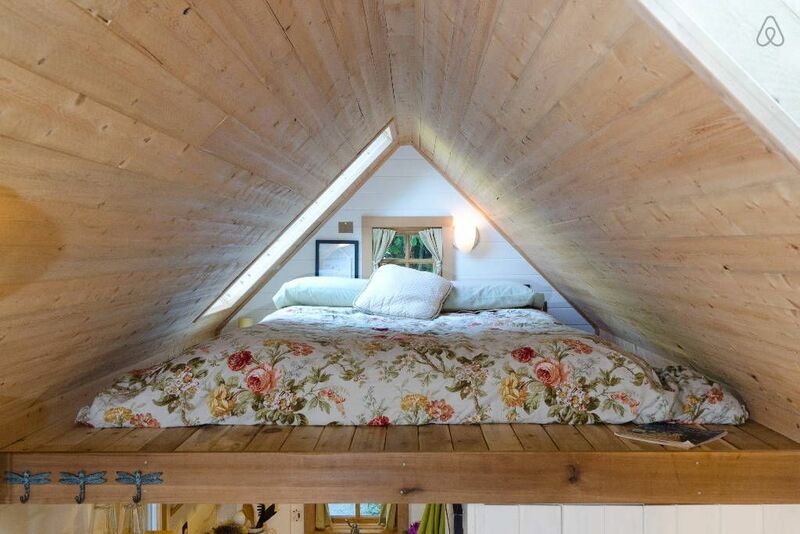 Surprisingly, the bedroom loft is big enough to accommodate a king-size bed. 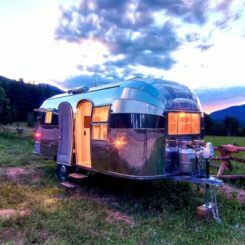 The bathroom – 20 square feet — includes all the musts: a mirror, small closet with a 20-gallon water heater, sink, shower, and toilet. It makes innovative use of a low-flow faucet that is used on boats and which can be hung to serve as a shower. 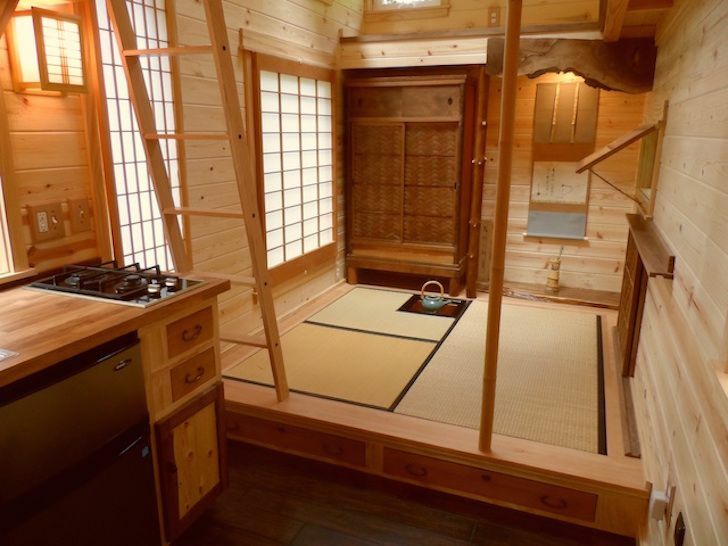 A tiny house means less furniture but this small home done in makes the most of the tatami room concept. 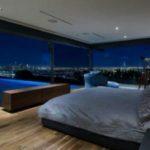 Pure minimalism at its cleanest and most serene, the home has the life amenities you need with none of the clutter or furniture. 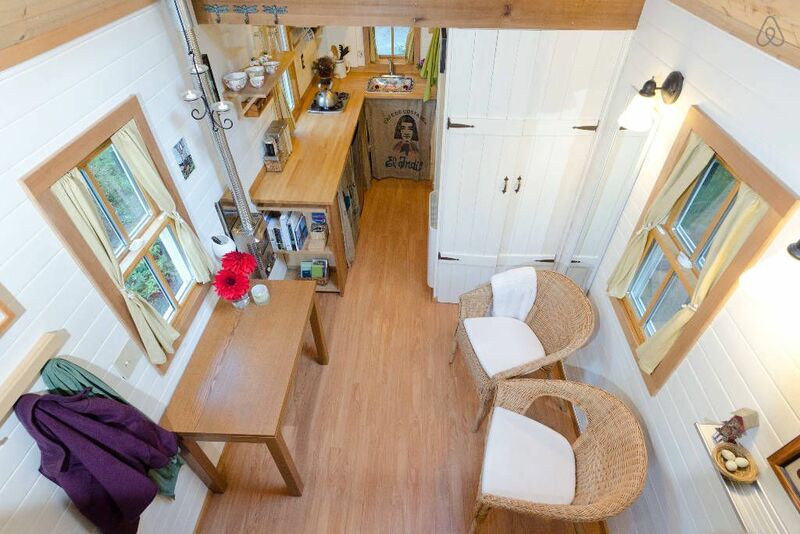 A tearoom, kitchen, loft, and bathroom make up the home. 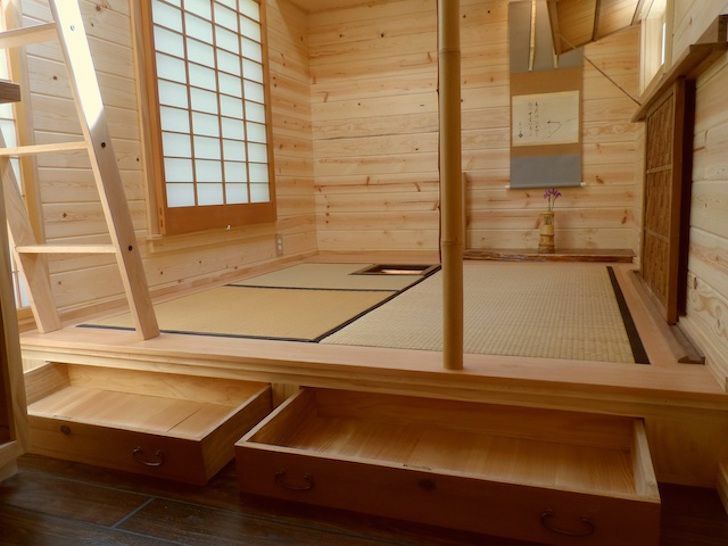 The décor is in line with Japanese traditions featuring tatami mats, a tea serving chest hidden in the floor and a soaking tub in the bathroom. Nearly a dozen windows and skylights honor nature by bringing views into every part of the space. Next to the tearoom is the kitchen, with plenty of workspace on the 5-foot- butcher block counter. 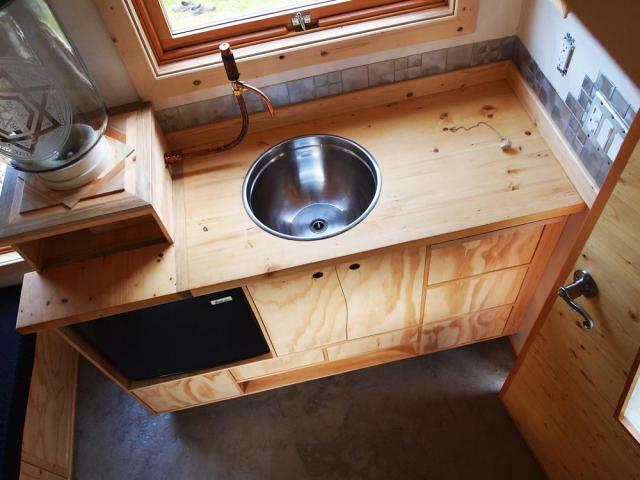 The compact kitchen includes a sink, fridge, freezer, storage, and a two-burner gas range. 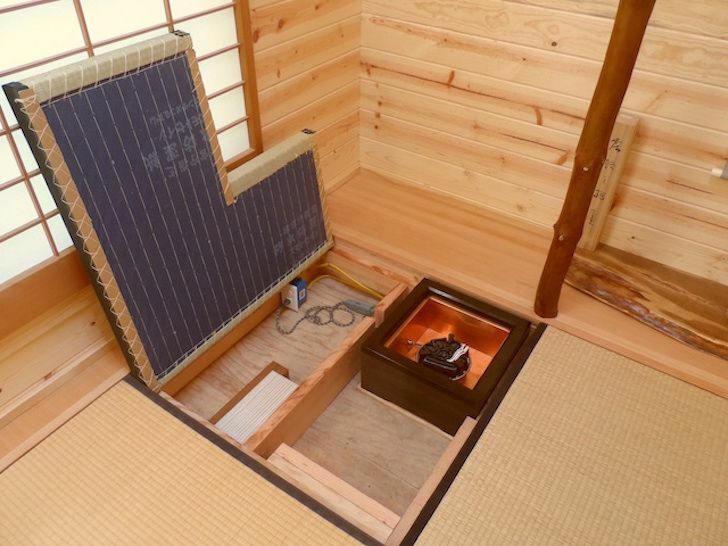 Japanese style carries into the sleeping loft that is above the kitchen, where three traditional two-and-a-half-inch-thick tatami mats serve as bedding. 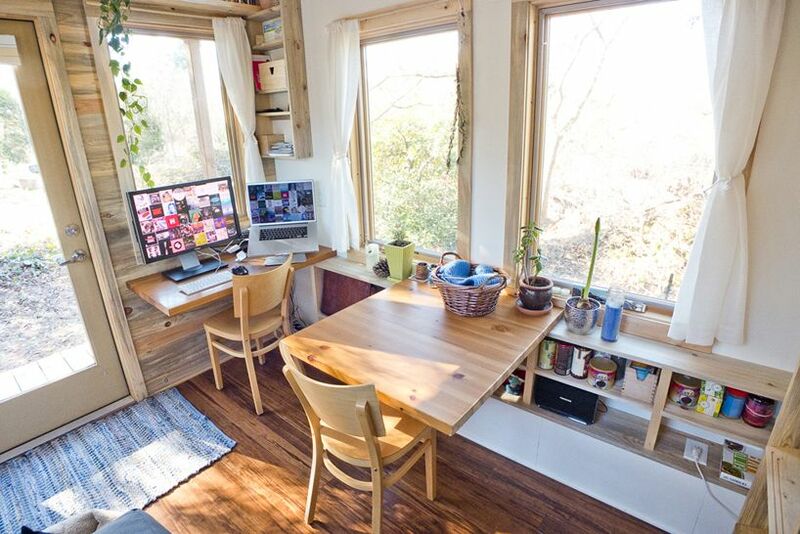 This is a beautiful tiny space that should appeal to those who feel at home with minimalism. 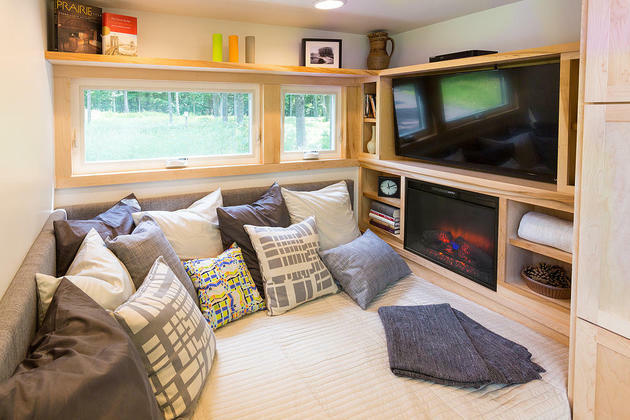 Some tiny house enthusiasts decide to make downsizing a complete DIY project, as Christopher and Melissa Tack did. 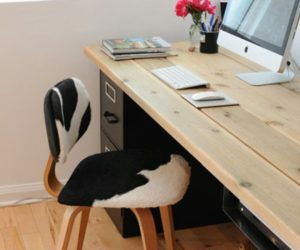 The couple crafted a unique design that fits their life and work styles. The home they designed and built is able to accommodate both her career as a 3-D artist and his work as a photographer – and their two cats. Storage space for his gear doubles as seating or sleeping space. 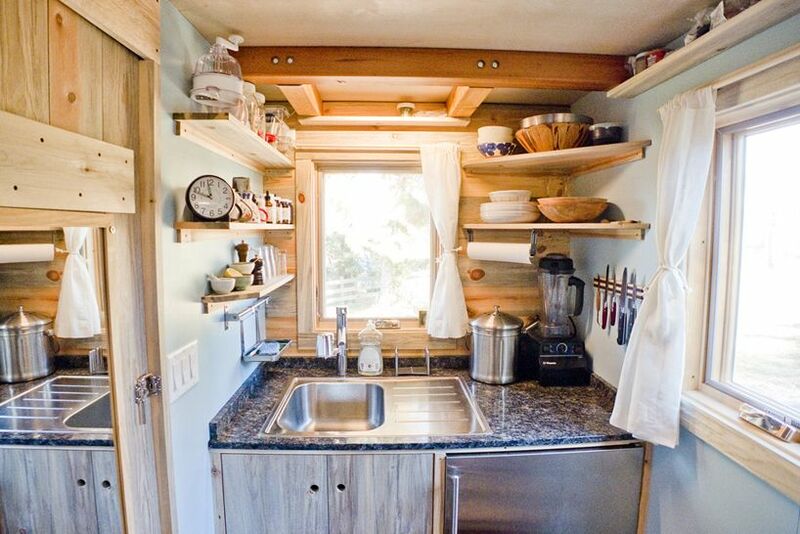 Tiny house living doesn’t need to be a complete lifestyle change. For some, it’s more a retreat and recharge experience. 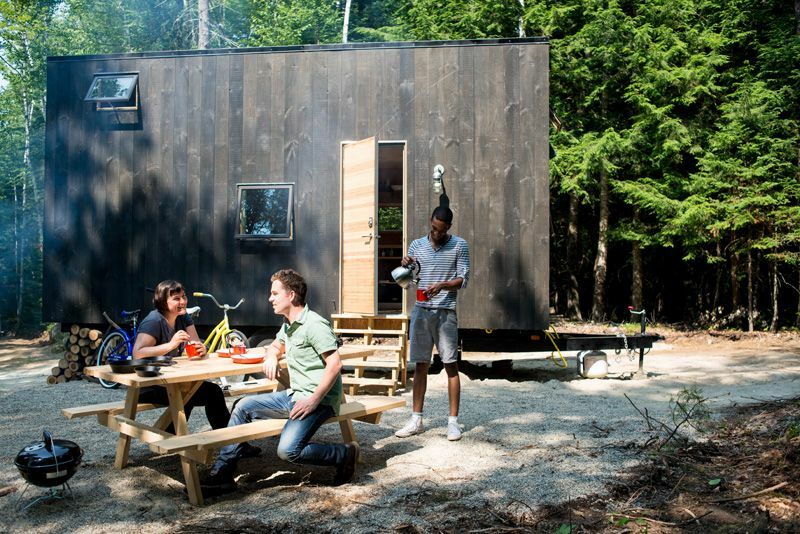 Through , a Harvard start-up, you can book a tiny house in the woods, unplug, and completely relax – or focus on a project, whichever you choose. 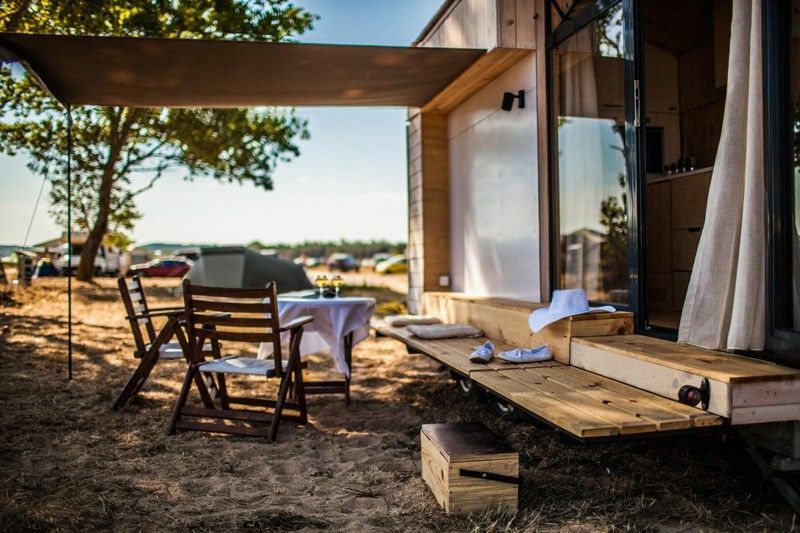 Using tiny houses that were designed by students at the Harvard Graduate School of Design, the company books tiny houses in the woods that are close enough to Boston to be accessible, but far away enough to provide an unplugged experience. 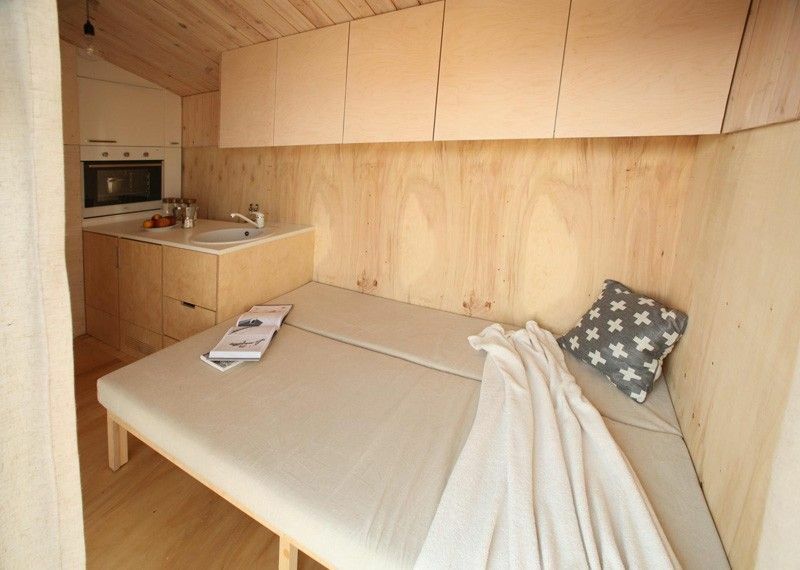 While tiny, the stylish homes provide a queen bed, a stove, a toilet and shower, and classic books and board games. 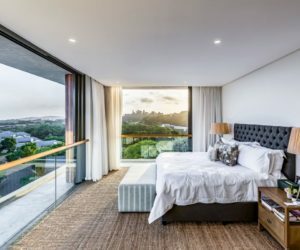 Clean and minimalist, the homes have plenty of windows for wooded views, and have the comforts you need with plenty of floor space left over. While perhaps not designed for long-term, daily life, these retreats are reminiscent of a fun old-fashioned cabin. 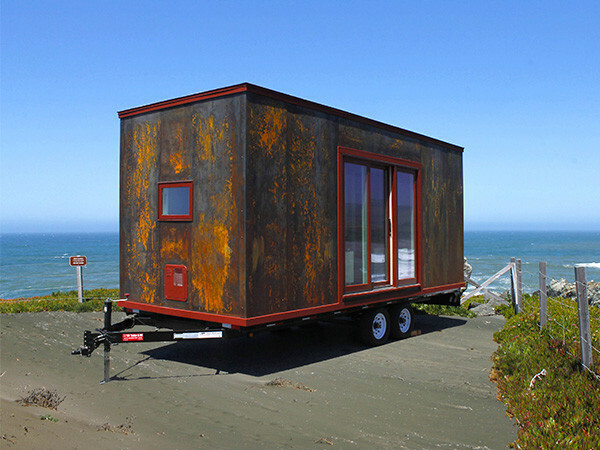 In what perhaps might be the ultimate in upcycling, this tiny house is a salvaged trailer. 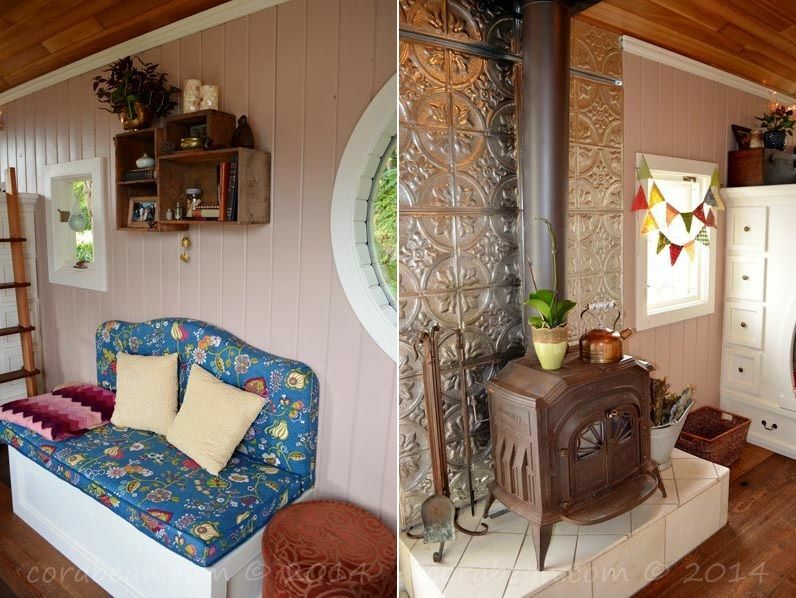 In just three weeks, an Oregon man salvaged, renovated and sold this 200-square-foot cottage…for more than ! 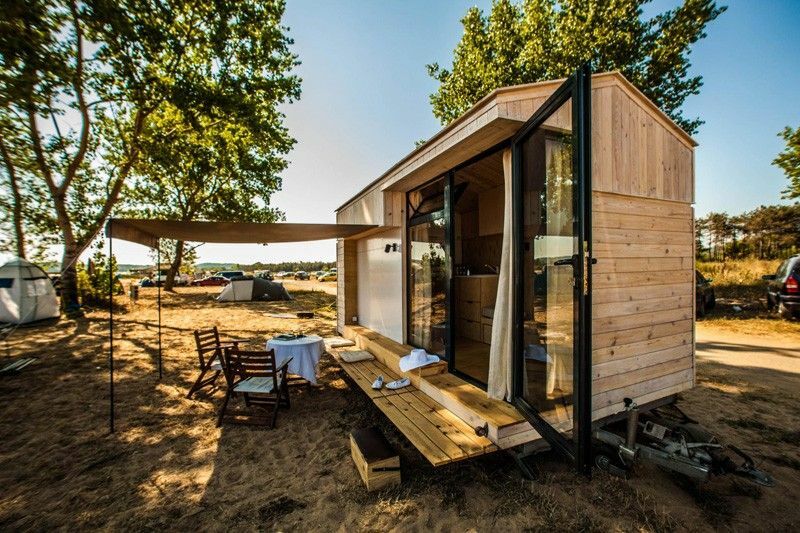 Unlike many tiny houses, this one looks more “residential” than many, both inside and out. The portico and windowed door look like they belong in just about any suburban neighborhood. 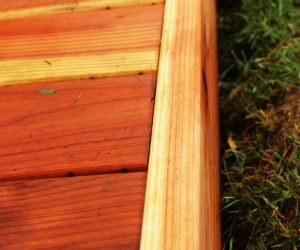 The deck is removable should you want to move you home to a new location. 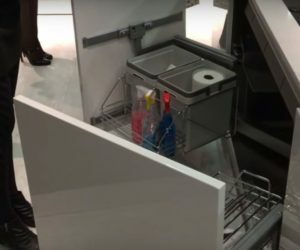 Inside, the home has an apartment-size range and oven, large refrigerator, a sink that has a pull-out faucet, and traditional cabinet storage. The space is light and airy thanks to windows as well as interior glass doors. 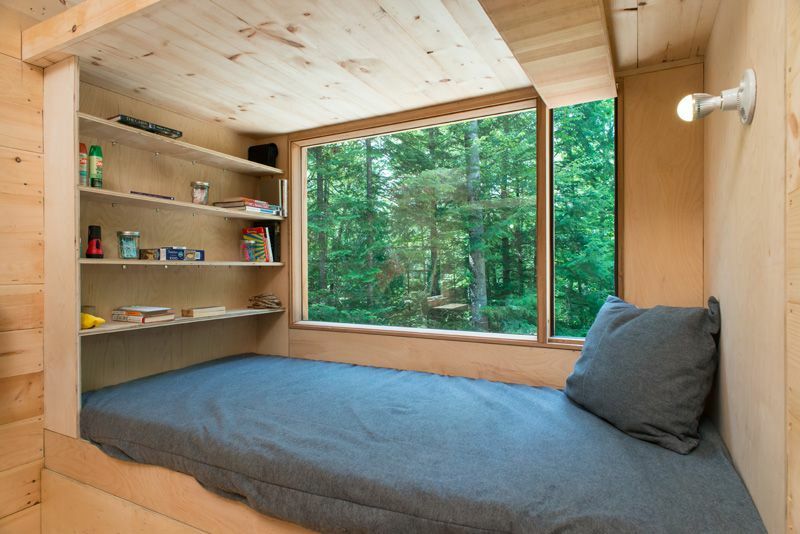 The living space includes a seating area and the sleeping loft. 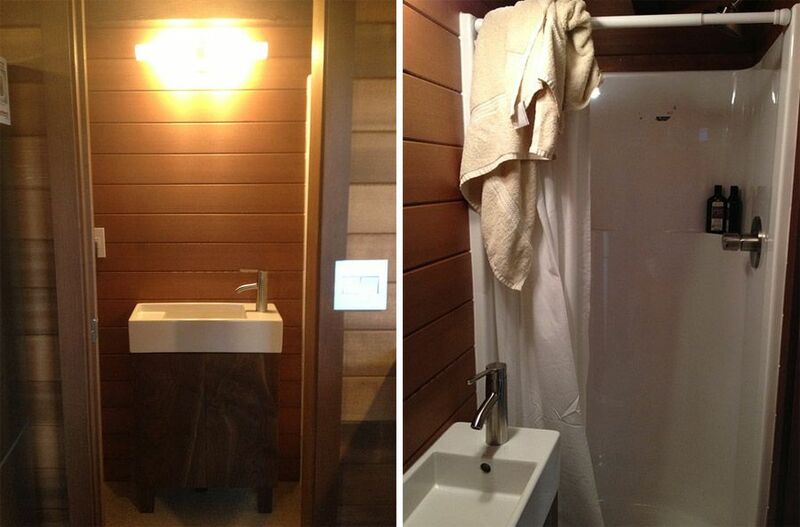 Amazingly, the bathroom includes a 32-inch shower! 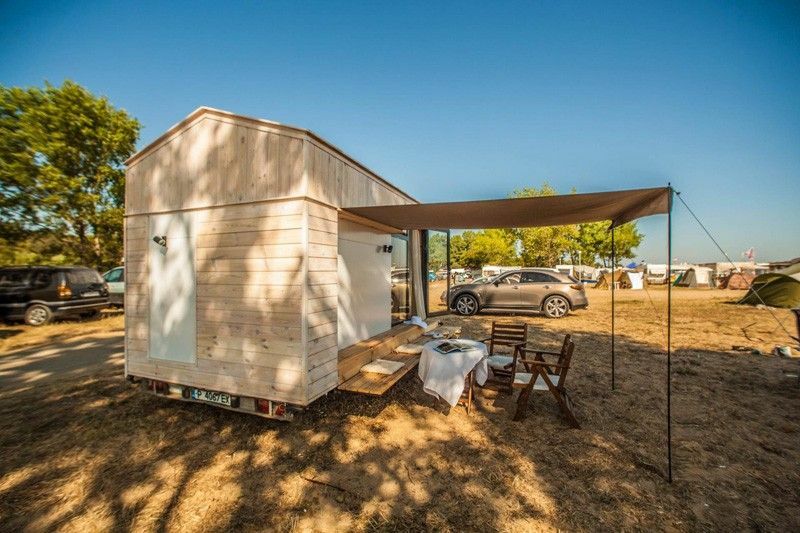 It might be shaped like a trailer, but this sophisticated looking tiny home is a stunning design inside and out – and it’s totally off the grid. 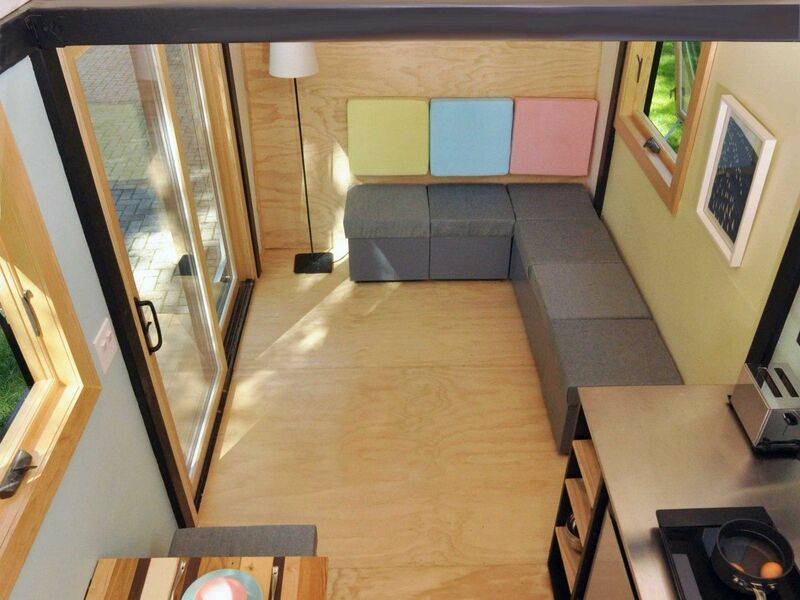 The 8.5-foot wide, 221-square foot home is deceptively spacious. 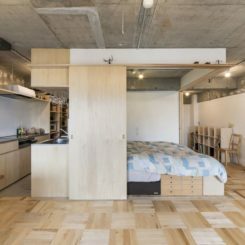 The design makes the most of the space, featuring not just one bedroom, but two! The main bedroom is accessed by stairs that double as storage space, and the second can be reached by a ladder. Downstairs, the home has a true cook’s kitchen complete with ample counter space, a range and stove and even a wine cooler and full-size fridge. 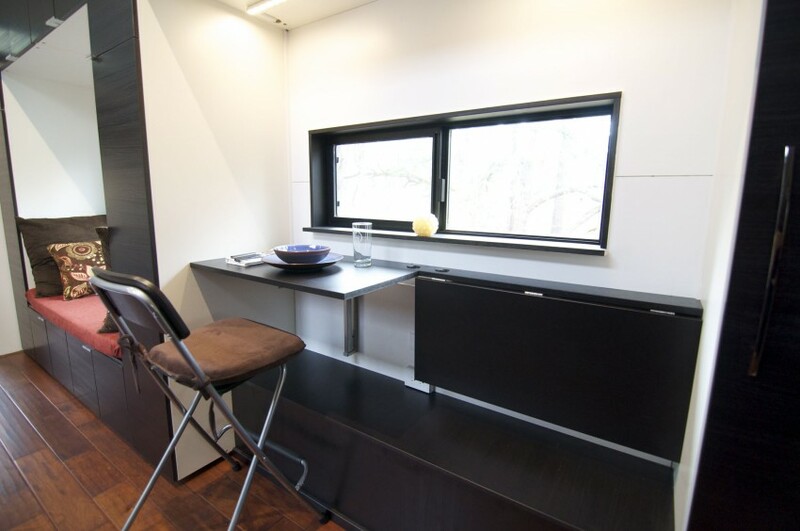 The living area features a cozy window seat area and a dining or work table, separated by a wall divider of storage space. 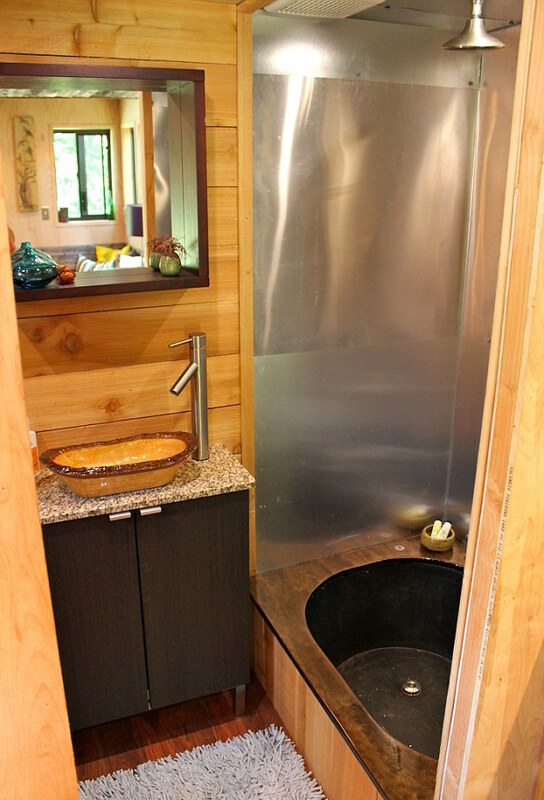 The bathroom has a sink area and a composting toilet. 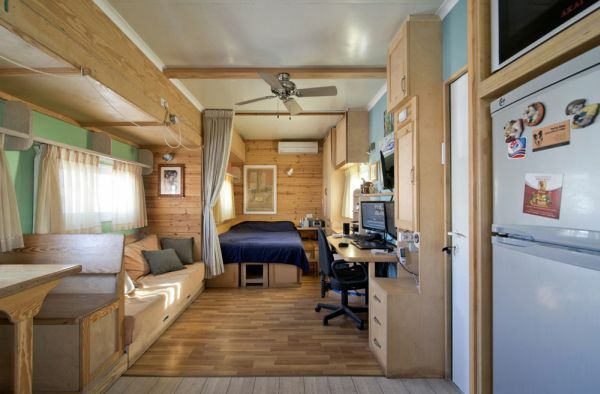 If you have to go off the grid, this is an example of how to do it in style and comfort. 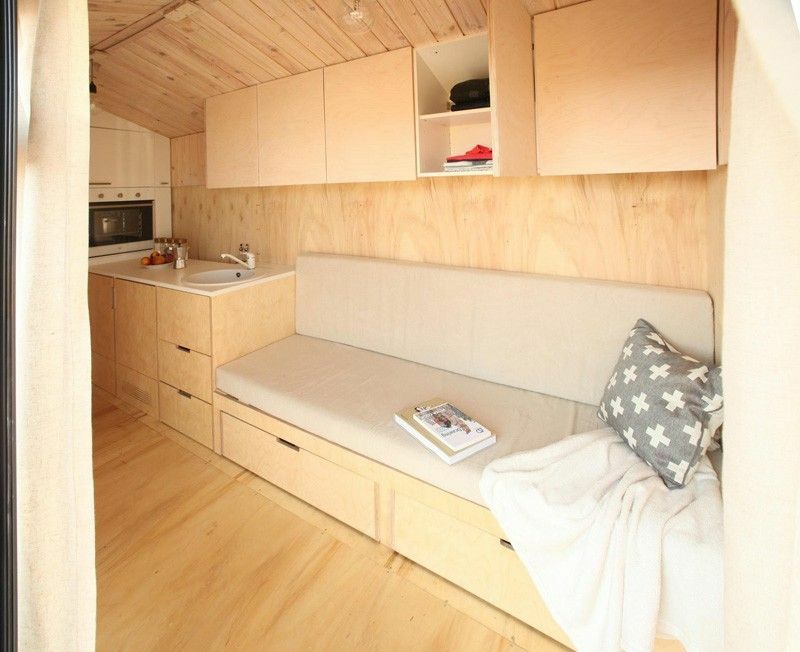 For some people – like Designer , a tiny house on wheels is the ultimate vacation house. 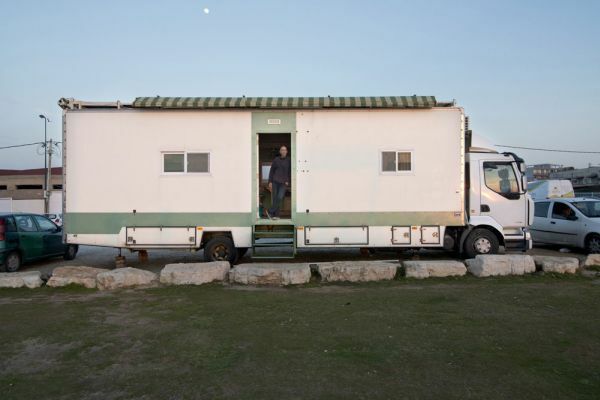 Her 9-square-meter vacation house can drive down any road and provide her family with an affordable beach retreat. 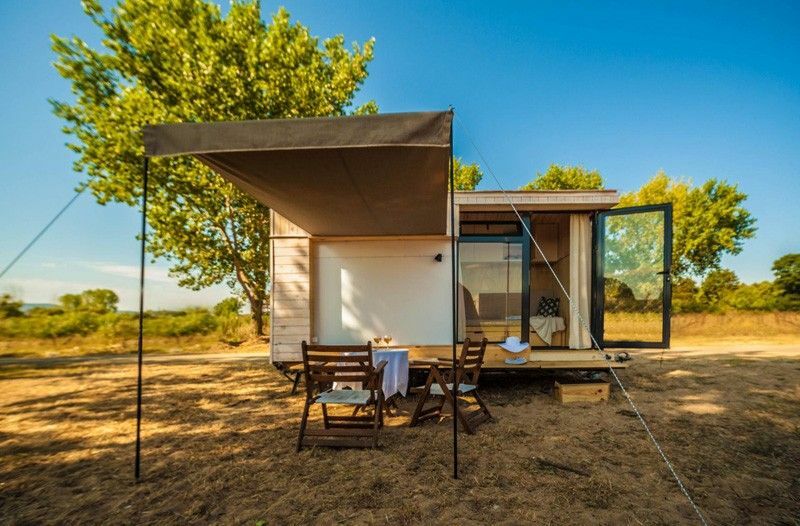 The most striking feature of this tiny, portable home is the floor-to-ceiling windows on half of the home. These let in ample light and allow for fantastic views of the beach – or wherever the family makes their vacation. Inside, seating converts to a sleeping area and a sink, storage and microwave make up the spare but functional kitchen area. That and a WC is all you need when you’re spending all your time outdoors, which is aided by a retractable canopy. This vacation home may be a low-budget investment but it has a high return in functionality and vacation enjoyment. 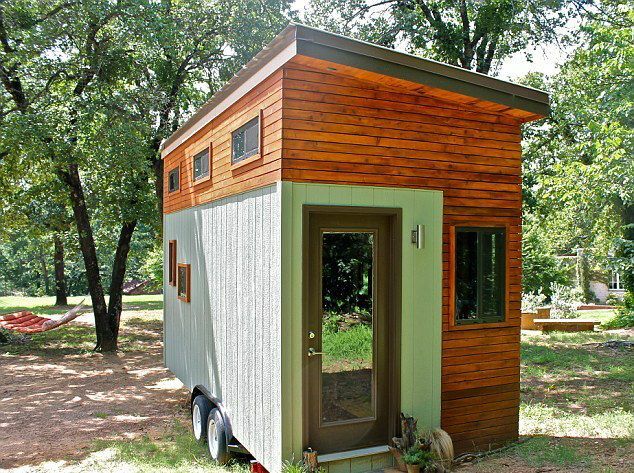 Truly very tiny, this is rustic and spare. 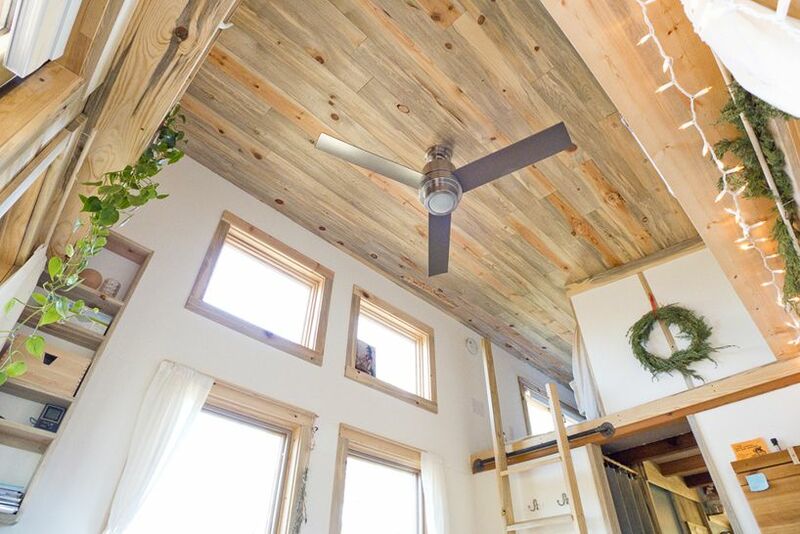 The fully insulated home stays cozy with radiant floor heating. 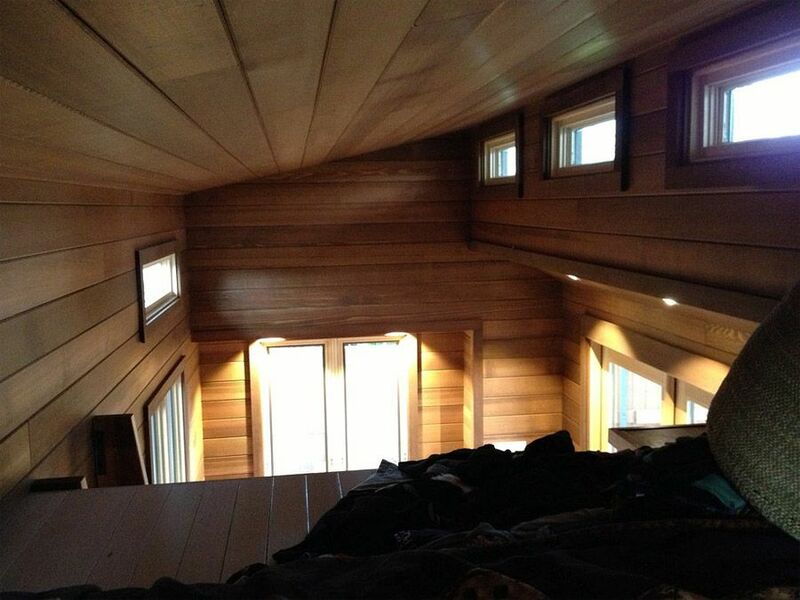 The windowed loft provides sleeping space. 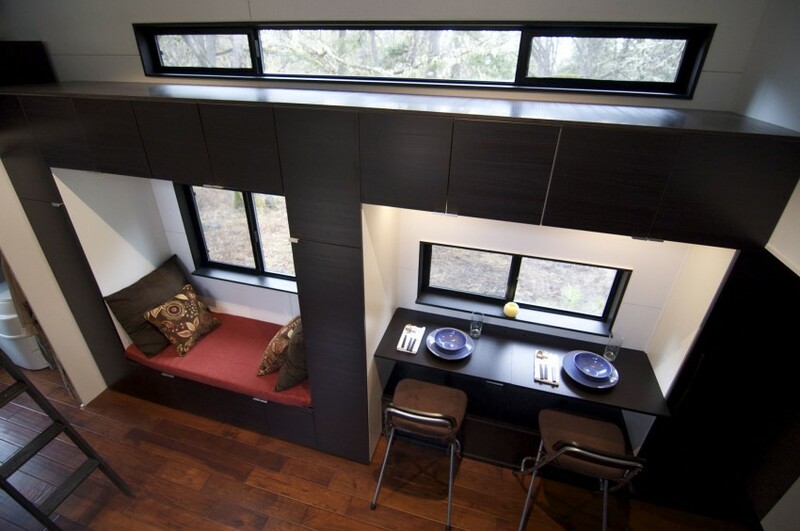 A custom fold-out table and bench seats feature in the living area, which includes a serviceable kitchen. 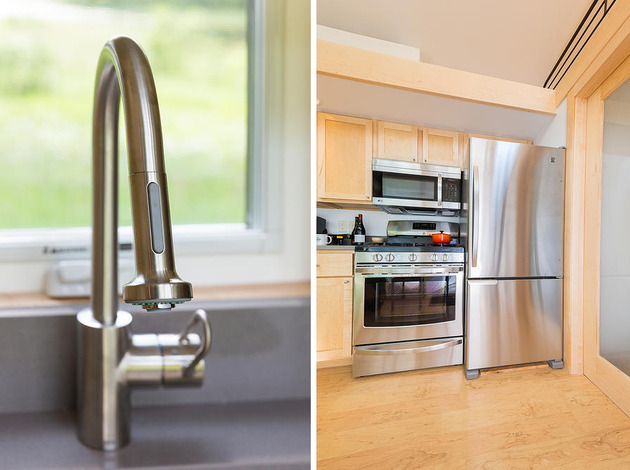 A mini-fridge, space for a cooktop, and water dispenser make up the kitchen amenities. 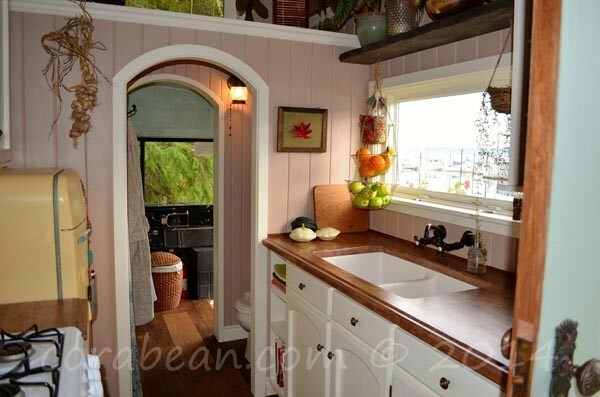 Unique and quirky, this one might be a little too rustic for some homeowners….no toilet or bathroom! 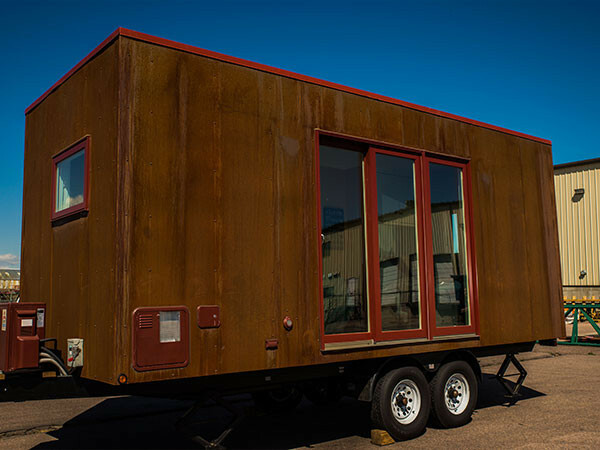 More windows than wall space make up this tiny home on wheels that is only 8 feet by 20 feet. Airy and light-filled, the house was a weekend DIY project for owner. 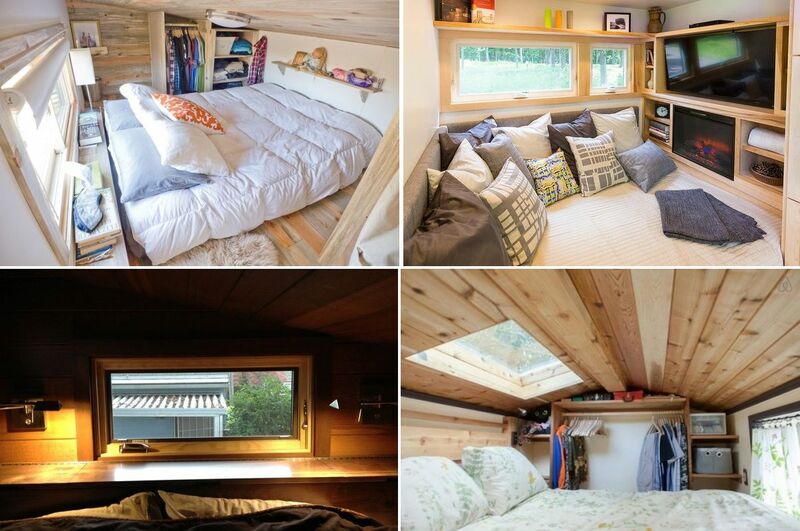 It turned out to be a very functional and comfortable house that has plenty of storage space. 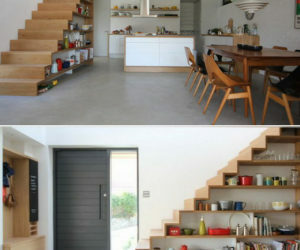 In addition to a seating are, the home features two work/dining tables and plenty of shelving for display and storage. 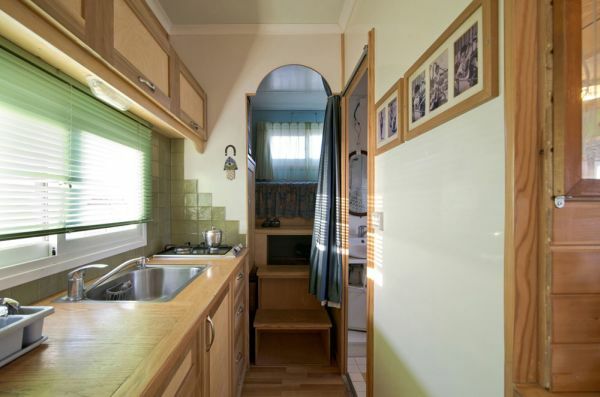 The kitchen has all the basic amenities and the bathroom includes a sink, toilet and shower. 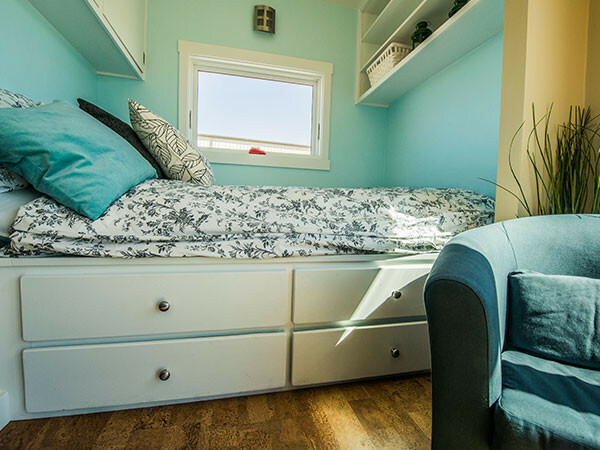 The sleeping loft has an amazing amount of space – enough to accommodate a closet, shelving and headboard/nightstand combo that incorporates storage. 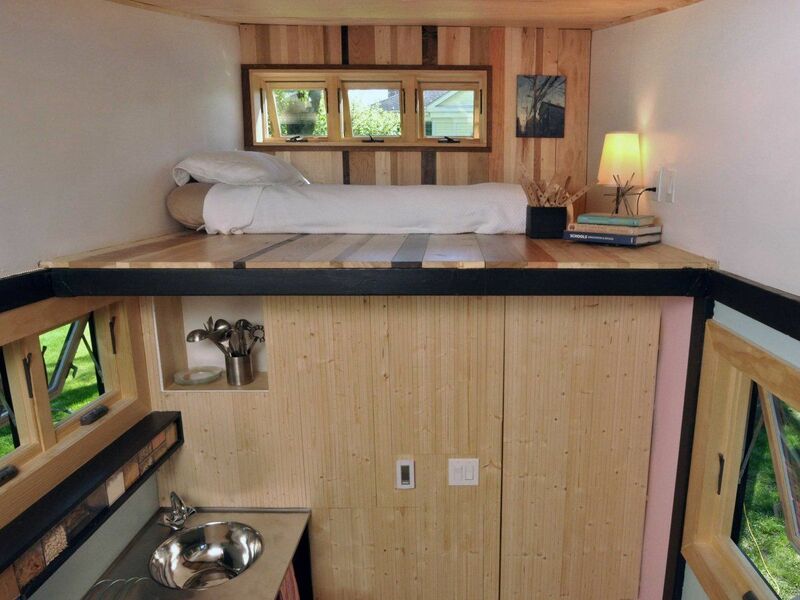 It’s got more than most sleep lofts in tiny homes. 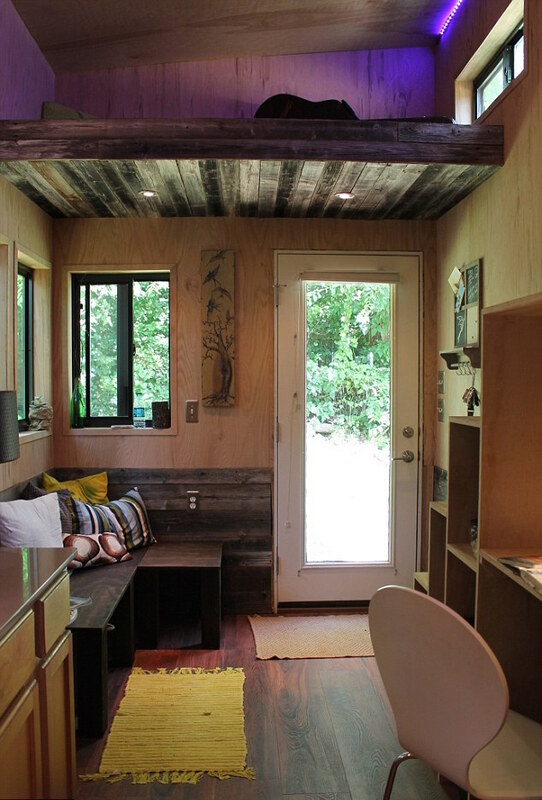 This “” tiny house has cozy, rustic charm galore. The warm wood exterior carries through to the interior, letting the wood’s natural charm be the focus. 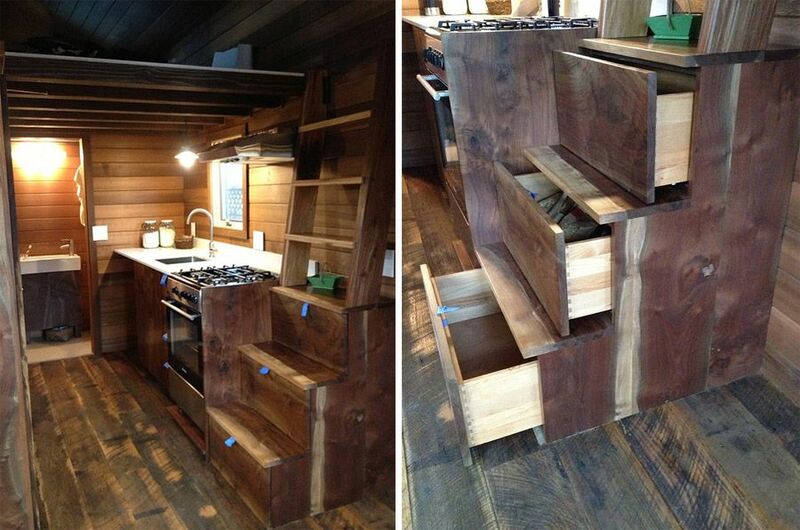 The kitchen in particular, highlights the wood and its beautiful grain on the walls, the floors, and the cabinetry. 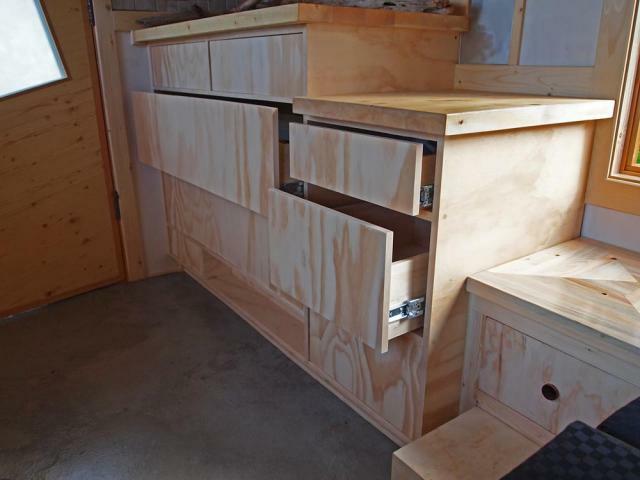 In fact, the stepped drawers serve as the first few rings of the ladder to the sleeping loft. 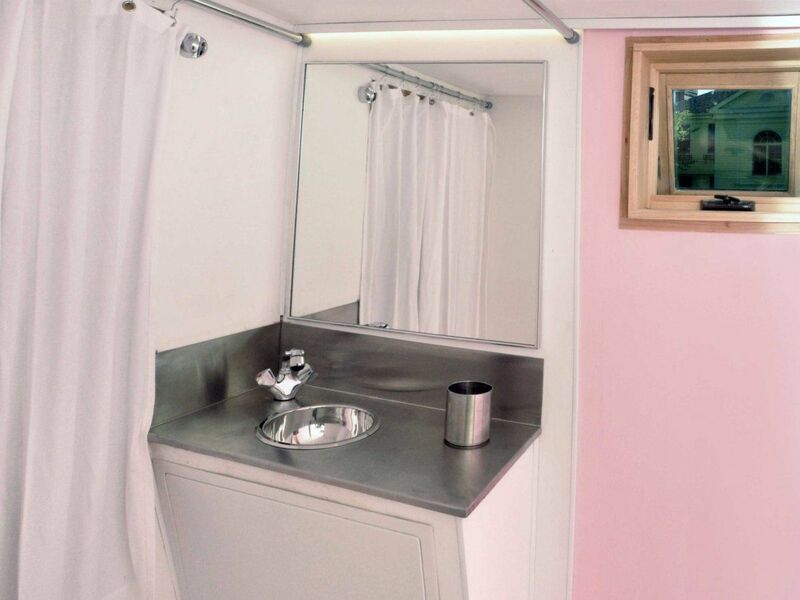 The bathroom has all you need, including a sink, toilet and shower. 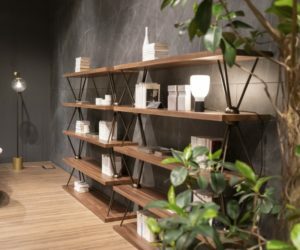 While there are numerous windows, including the expansive double glass doors, the use of dark wood necessitates plenty of light fixtures to keep the space well-lit and functional. 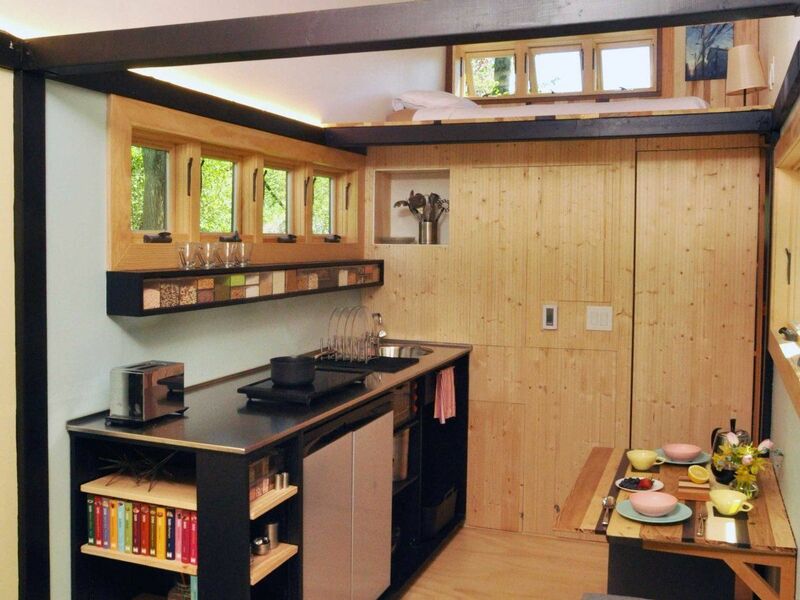 Whether it serves as a getaway home or a full-time living space, this micro home has everything you need. 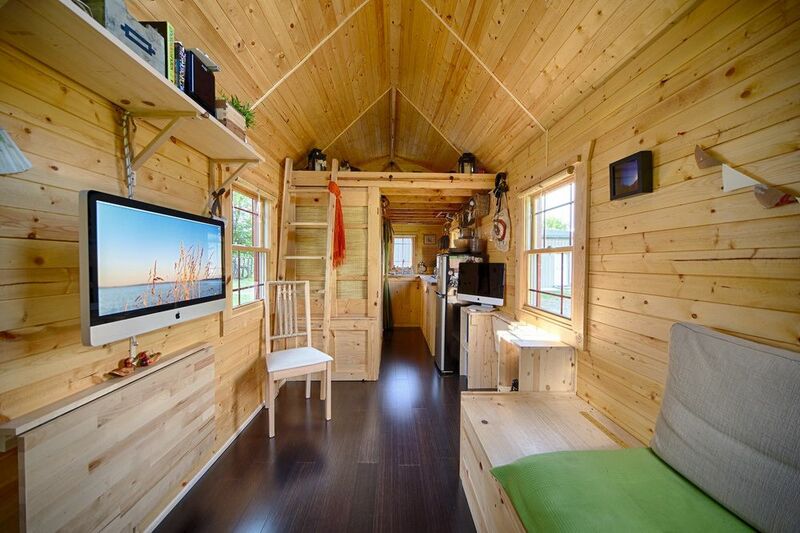 Not all tiny homes are rustic, minimalist or bare bones. This version is an example of luxury on wheels. 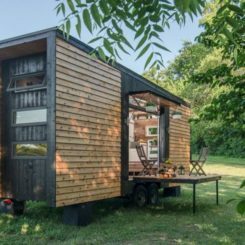 Rather than a multifunctional micro-home, this house on wheels is a miniature version of a detailed suburban home, including premium woodwork and entryway. 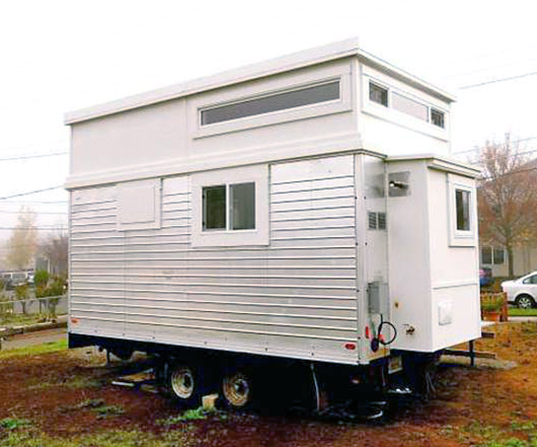 The Oregon-based manufacturer can build you the luxury house on wheels of your dreams…starting at a base . The exterior is wood-sided and resembles a salt-box style home, trimmed in white. 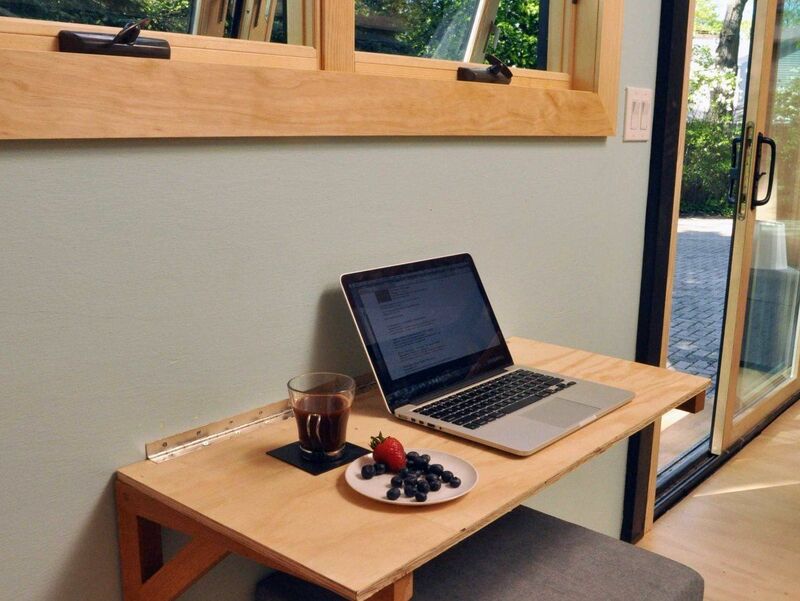 Inside, the entryway space doubles as a seating and work area. 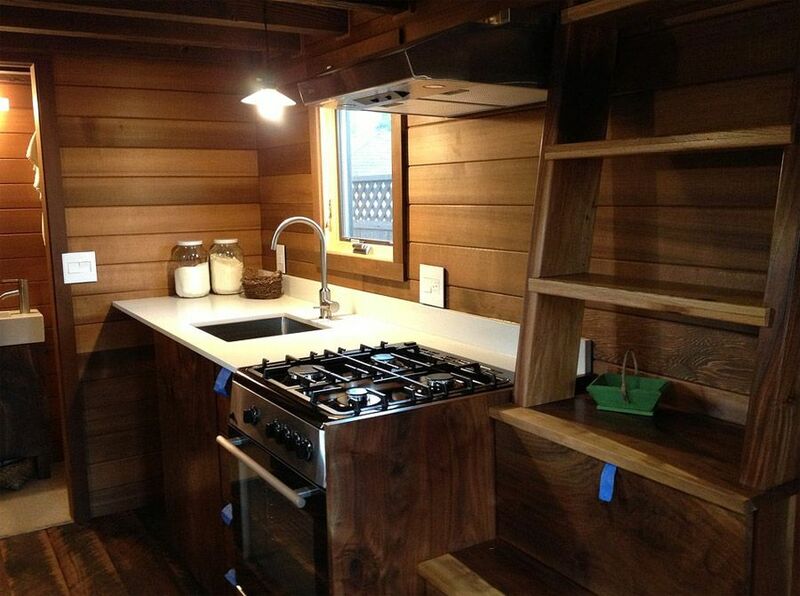 The kitchen has wood cabinetry and flooring. In addition to a heater, the home includes a washer and dryer and a more-than-functional kitchen, highlighted by a tiled backsplash. 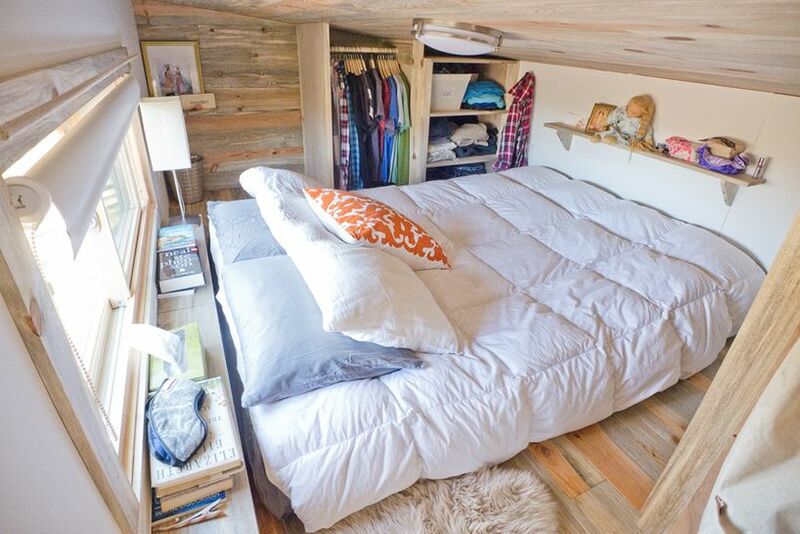 The sleeping loft is above the bedroom and features open shelving that can be used for display or storage. This model is truly your home, whether it’s a home on somewhere else. 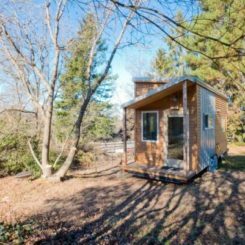 Freedom and lifestyle are often motivating factors for moving into a tiny house on wheels, but in this case, it was debt-reduction. 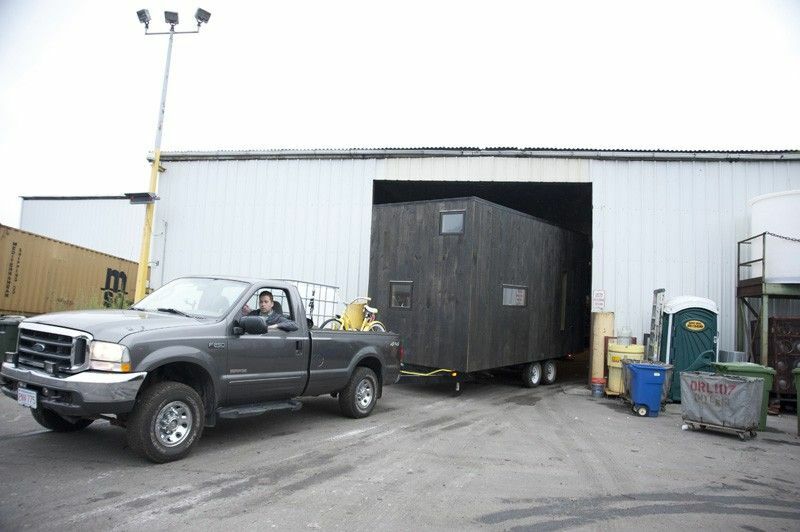 College built his own 145-square-foot home on the base of a flatbed trailer over the course of the year and will live in it during college to save on room and board. 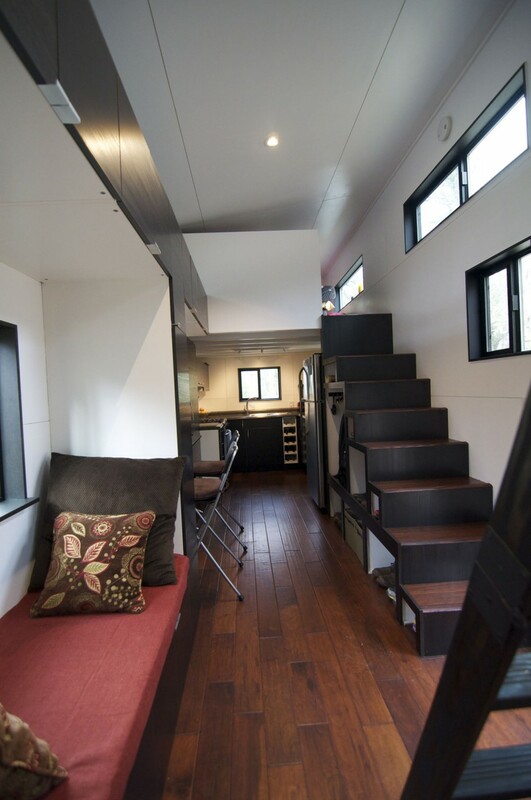 In addition to the standard sleeping loft, the house includes a comfortable seating area and work desk surrounded by storage cubes. 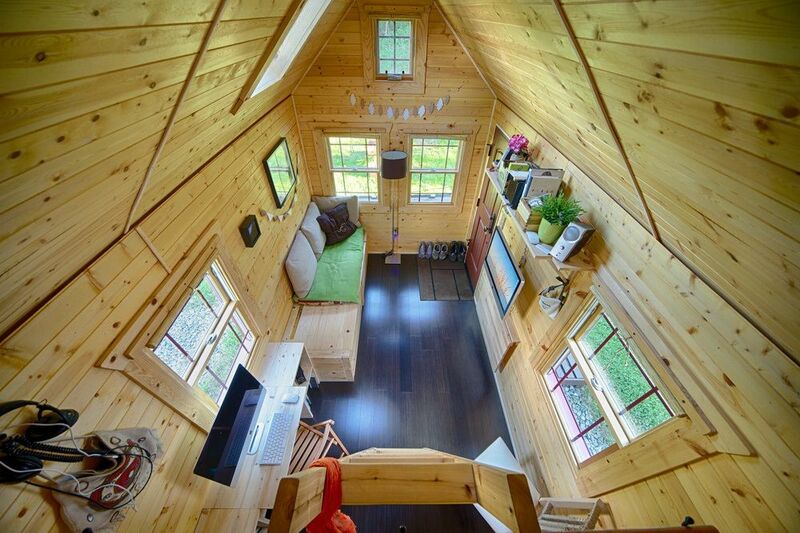 The top of the cubes serve as the stairs to the loft. The house has a small kitchen – what college student has time to cook anyway – and a good-sized bathroom, featuring a cool art-glass sink. 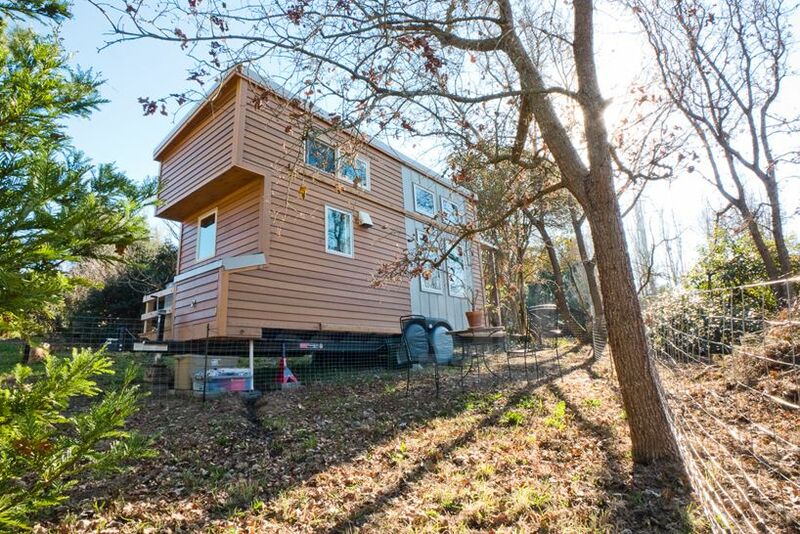 Weber may have built his tiny home on wheels to save money, but as a result, he will be living better than most college students in his cozy, quiet and comfortable place. 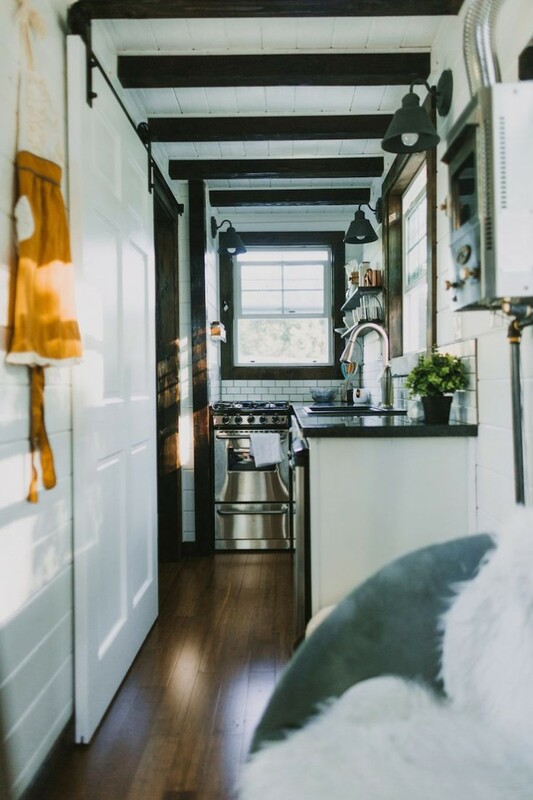 Styled after famed vacation cottages in Wisconsin, these romantic tiny homes are truly an elegant getaway. 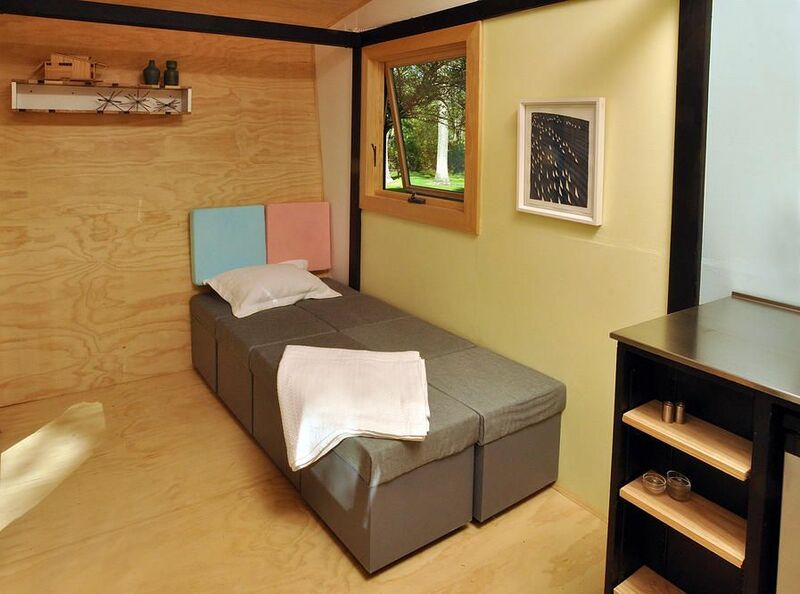 Only , they are smaller than many hotel rooms but can still accommodate up to six people. 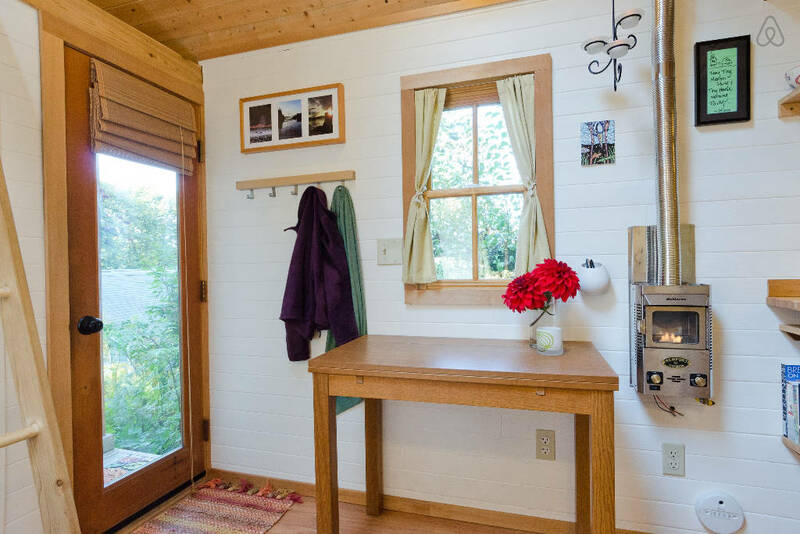 The bright and light home tiny cottage features light-colored wood, which enhances the atmosphere. Large windows not only let in plenty of light but also provide stunning views of whatever scenery you are visiting. 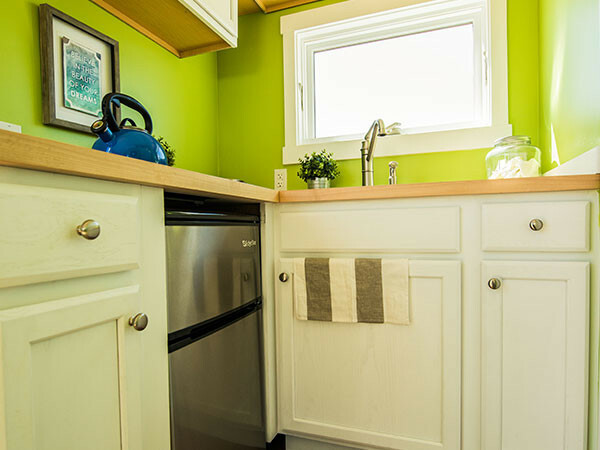 The amazing kitchen is fully equipped with a large stainless steel full size range, 30″ refrigerator, a microwave, and plenty of counter space and cabinets. 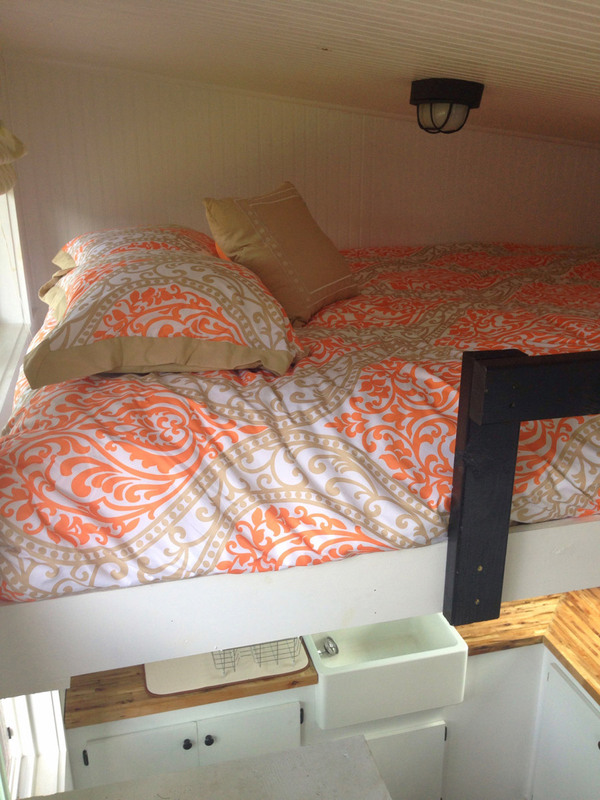 Both sleeping lofts can fit a queen size bed and the daybed sleeps two more people. The seating area includes a full-size flat screen TV. 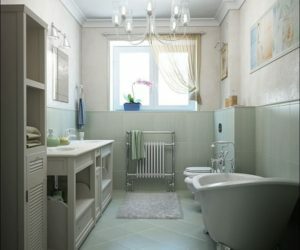 The most luxurious room is the bathroom. 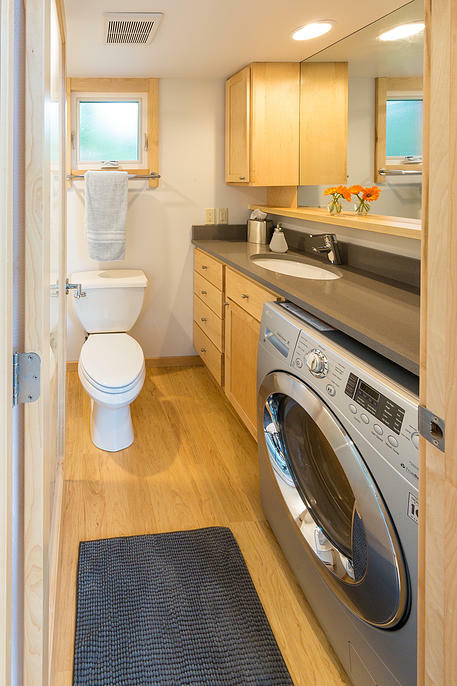 Much like bathroom found in a large home, it has a high-end toilet, sink, tub/shower combo and washer/dryer. 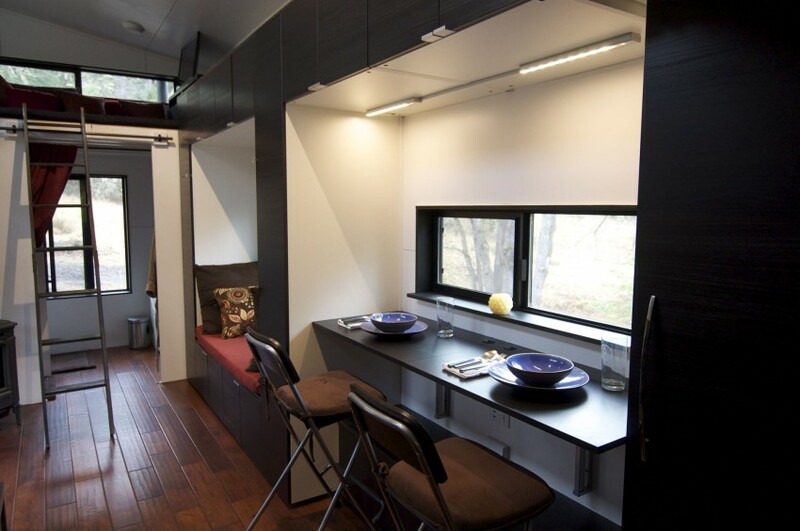 From the warm-wooded exterior to the amenity-laden interior, this tiny home on wheels is truly a luxury get-away. A steel box on the outside and a sunny beach-bright on the inside – can build you a model than ranges from 170 to 220 sqaure feet. The modern industrial exterior gives no hint to how sunny and happy the interior is. 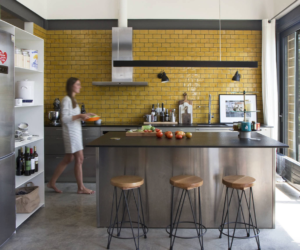 Sliding doors let in lots of light and the bright blue, yellow and white paint amplify the bright space. 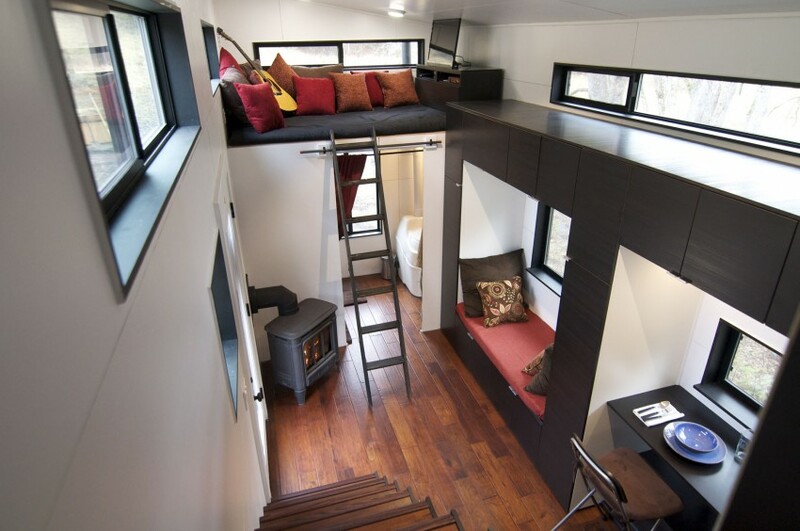 All one floor, the main bedroom is a closed off space, and a second sleeping area can be had from the seating space. A dining are and full service kitchen round out the home. 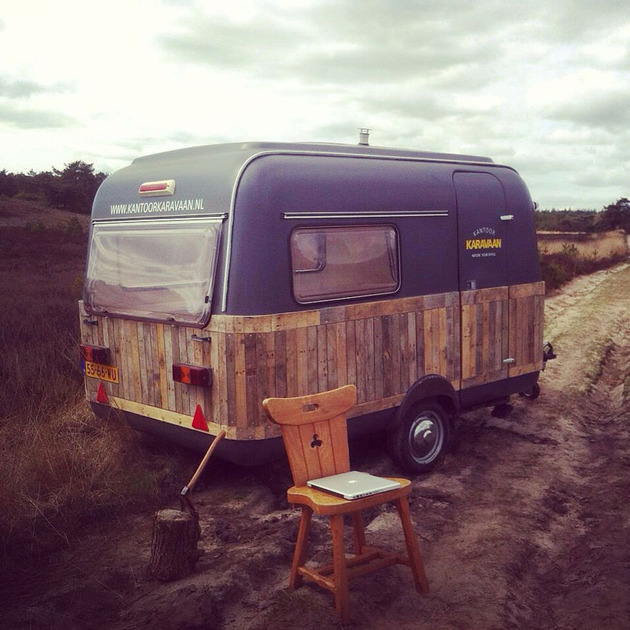 The perfect little homey space, no matter where you park it! Being “off the grid” doesn’t mean . 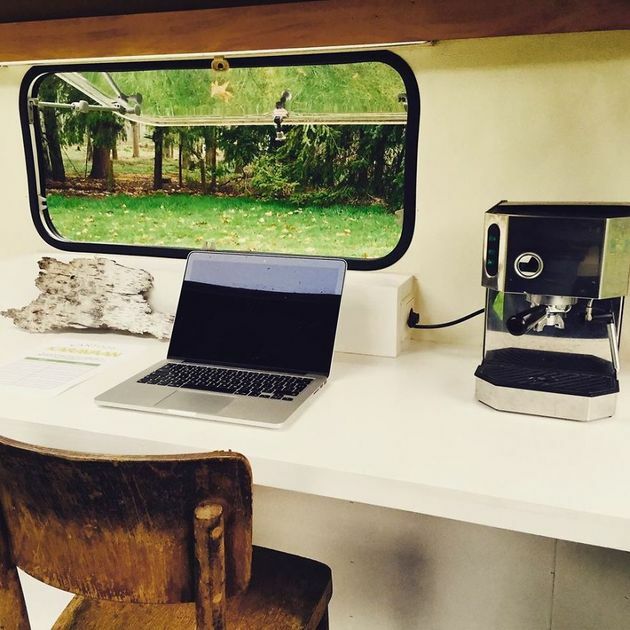 This tiny home on wheels is actually an environmentally friendly home office. 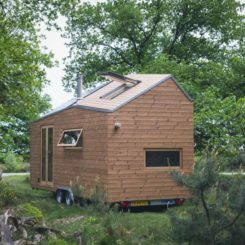 Built by a company in Amsterdam, it’ s solar powered and sustainable. Need to get away so you can focus on a project? Get a start on writing that book? This could be your ticket! 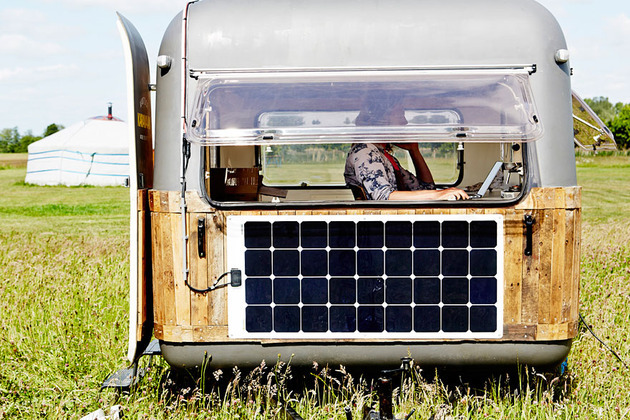 Solar panels power your laptop and phone, the LED lights, and last but not least, the espresso machine. Tired of working or strolling in the woods? Take a nap on the bed. When you’re ready to go back and face civilization, pack up and drive back into the city. 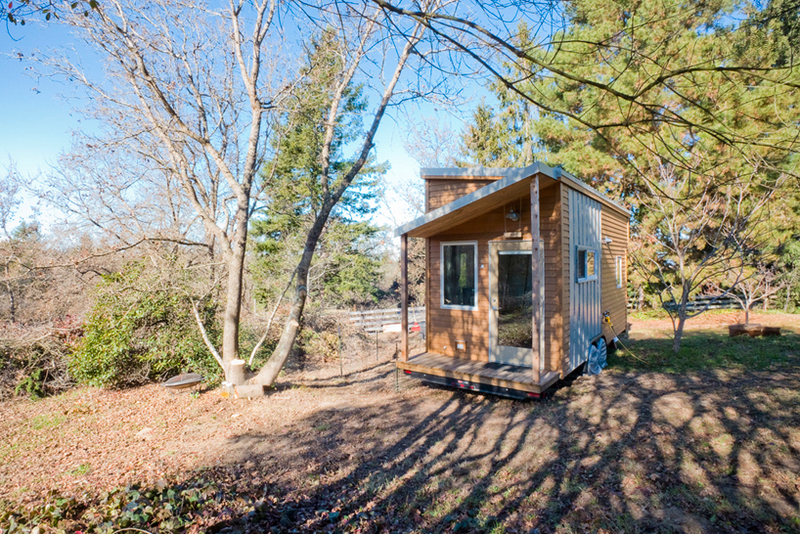 Not sure if you’re ready to take the plunge and downsize to a tiny home? 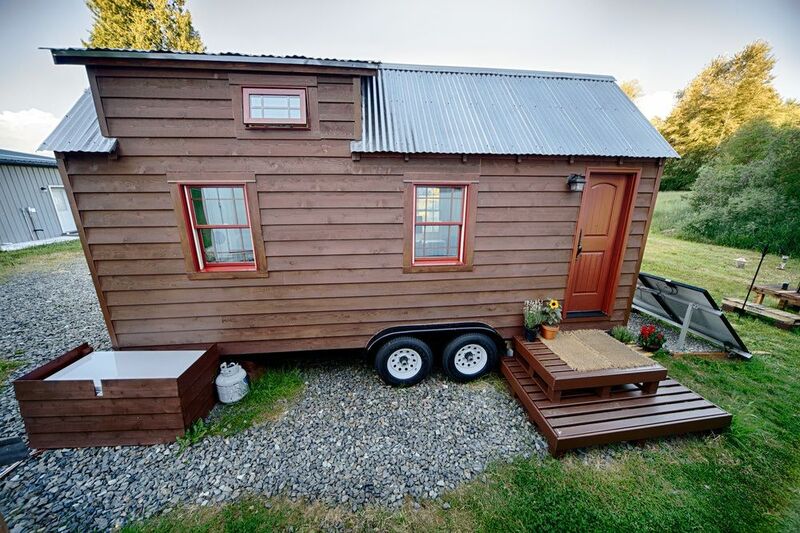 You can rent a tiny home and try out living there before you make a decision. It’s a big change, with both advantages and disadvantages, so make your decision and informed one. 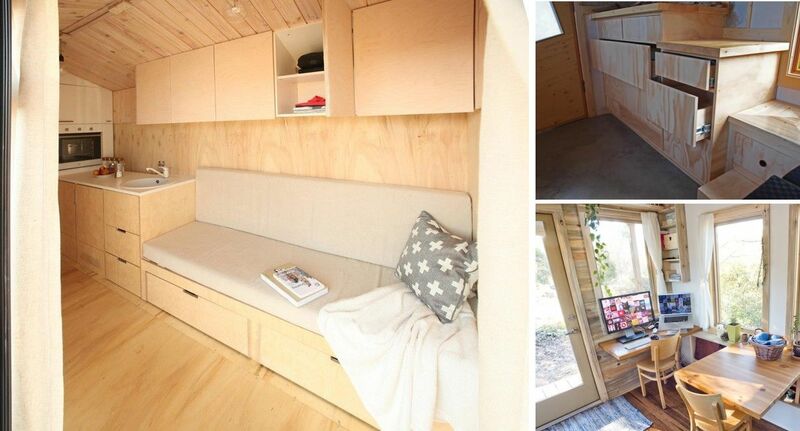 AirBnB has a variety of tiny homes for rent that you can sample. This , Washington is an A-frame style that has plenty of vacation style. 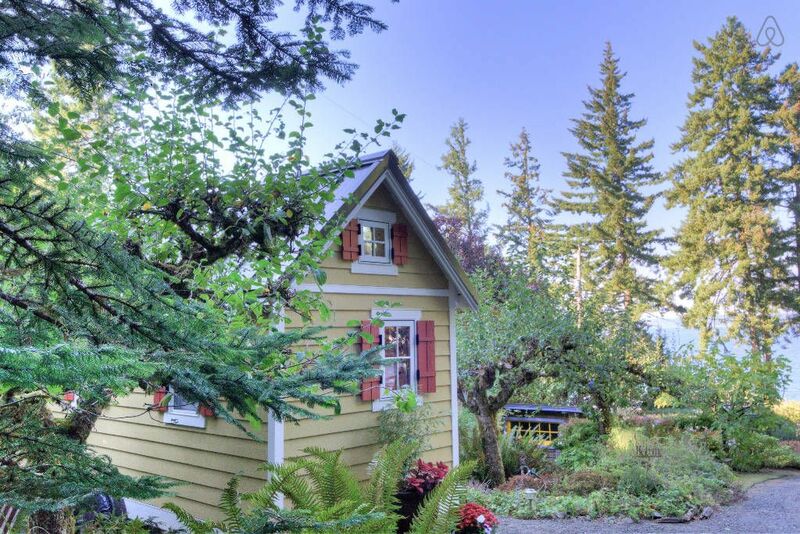 Nestled in the woods near the Puget Sound, it is stylish, light and bright. It has all the micro home amenities you would expect, including multipurpose table, sitting are and kitchen equipped with micro appliances. The mini gas fireplace is a cozy extra for any chilly nights! 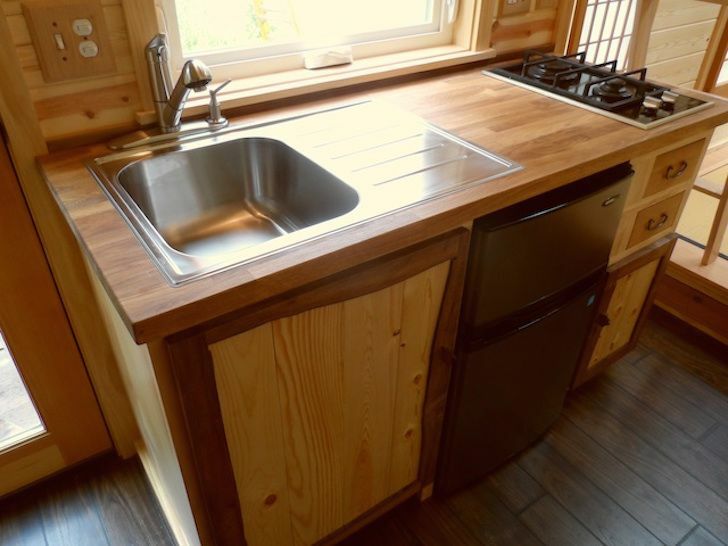 The galley style kitchen is fully equipped and even has a unique porcelain sink, showing that a small and functional space doesn’t have to include boring or plain fixtures. The full bathroom also has everything you need. With views and a landscape like this, who wants to spend time indoors anyway? 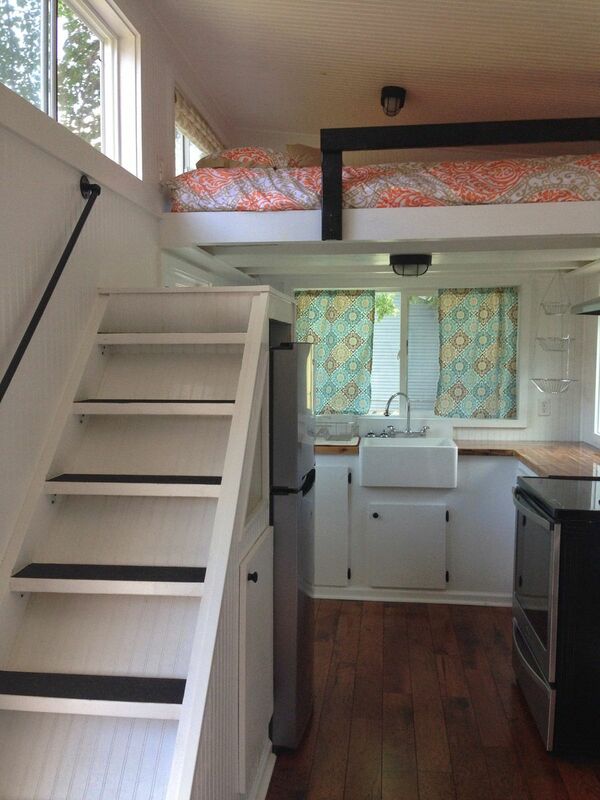 Listed as a rental, this tiny house on wheels has everything you need for full-time life. 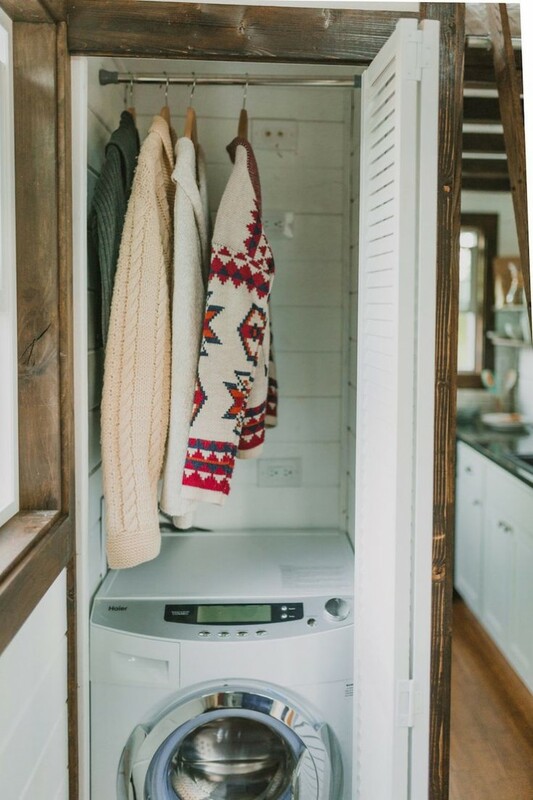 Perfect for a test run, the home, called “,” has some amenities that even larger homes don’t such as a laundry chute. 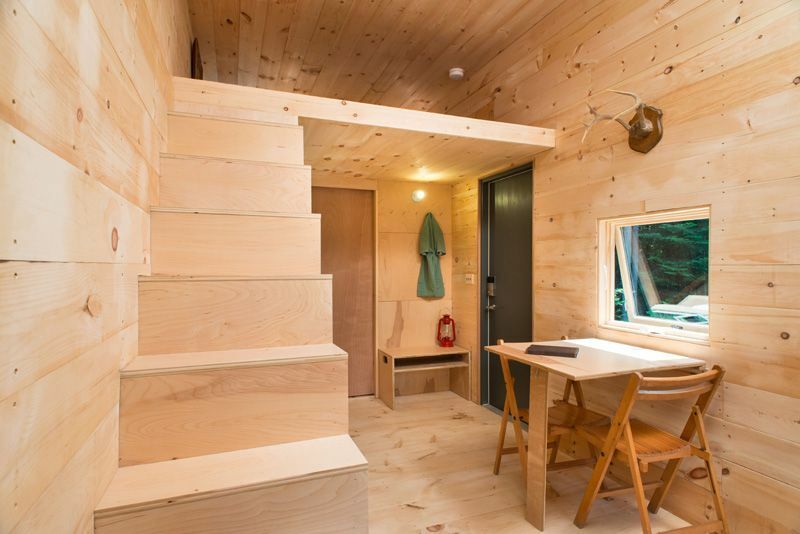 The micro home has real stairs a dining table, ample seating space, washer/dryer and a fireplace. 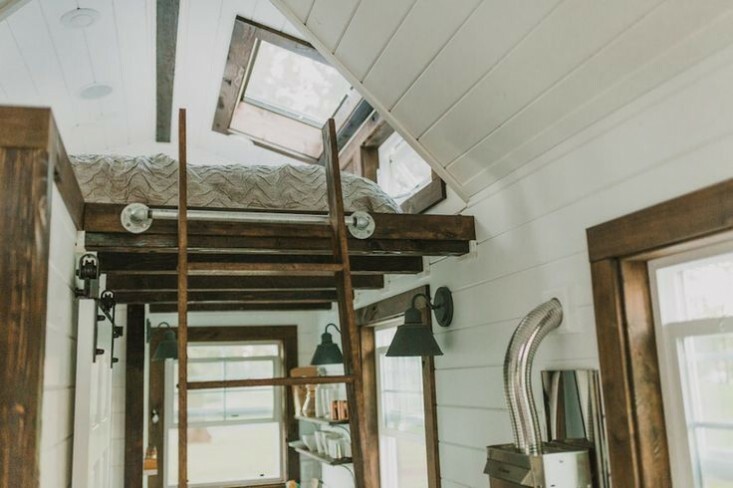 Cozy and functional, the sleeping loft is a lounging dream, and we can just imagine reading there for hours. 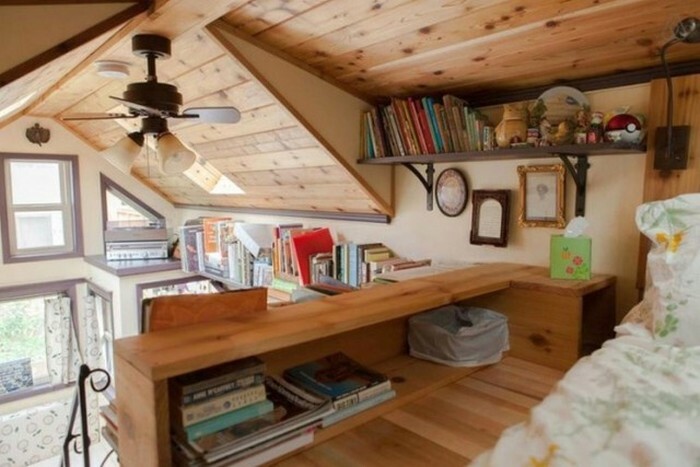 The extra storage and display space around the eaves allows for plenty of books and belongings. 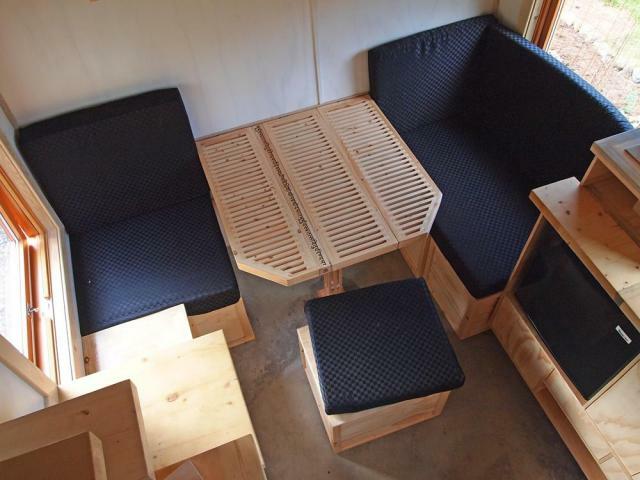 You can also convert the downstairs dining area into another bed. The design touches around the house make for a delightfully eccentric and interesting home! Planning a trip to Nashhville? 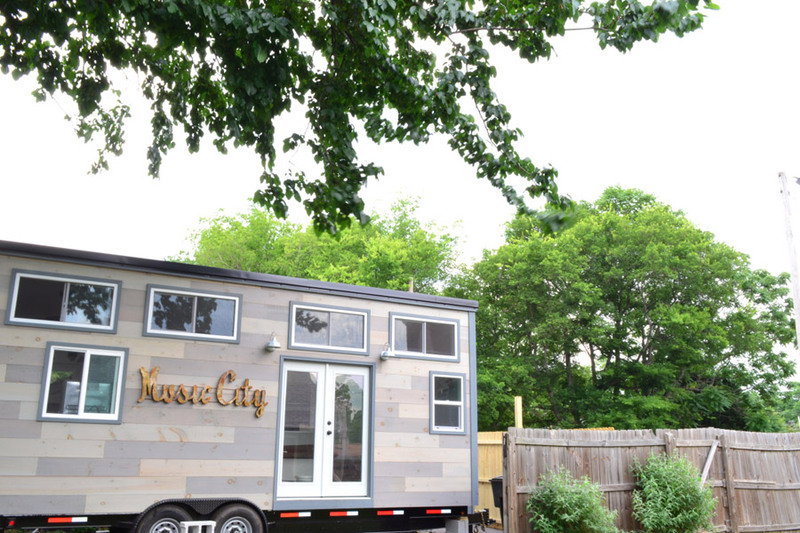 You can do more than just visit the land of Elvis — you can sample tiny house living in this charming . 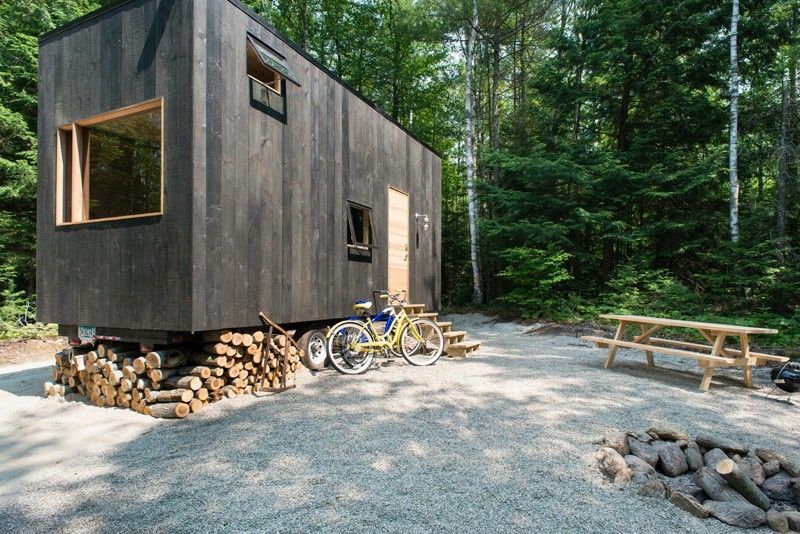 Built by a couple who hope to entice more people to the tiny house movement, it sports all the amenities you will need. 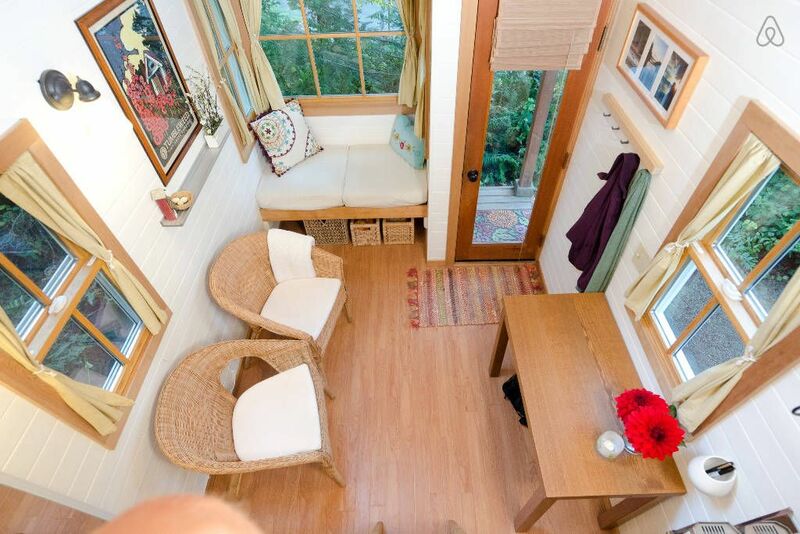 A roomy bathroom with a shower, two sleeping lofts and plenty of storage under the real stairs, it’s truly a miniature house. The kitchen also has a sizable oven with cooktop and tall fridge. If you’re comfortable with the design of the average suburban home, then this interior will definitely appeal to you! 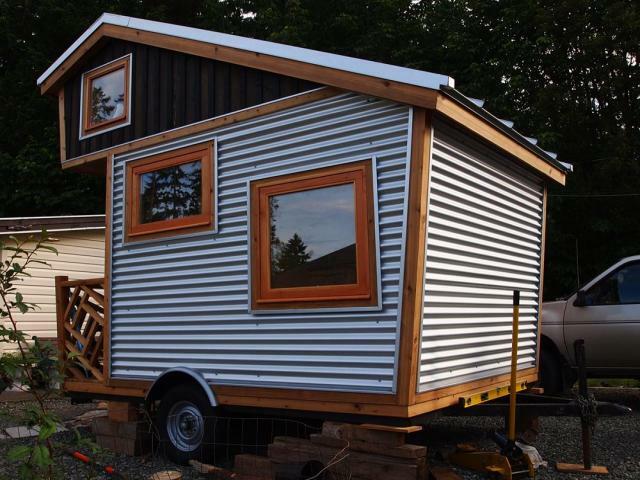 Not all people start from scratch when building a tiny home. 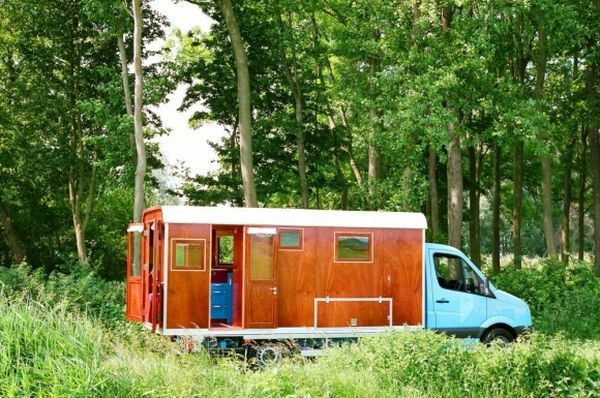 This gentleman decided to convert a truck into a very stylish, comfortable and portable home, powered by solar panels. 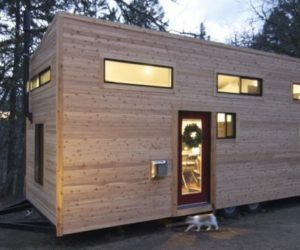 While it cost as much to create as a traditional home would — about $225,000 — it’s more like a mobile home than a micro house. 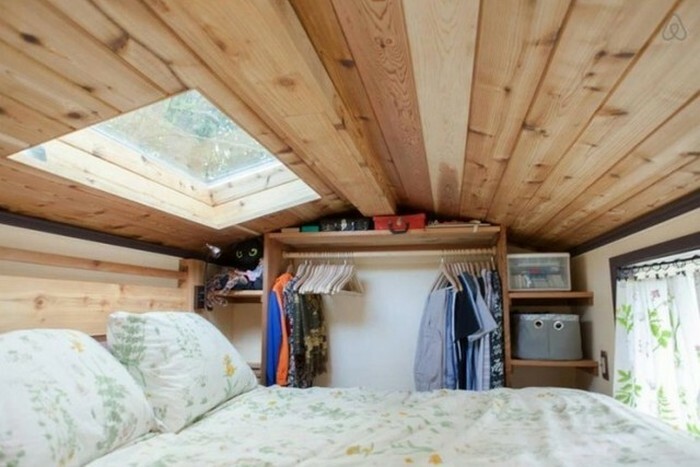 And, because its all on one level, it is more suitable for people with mobility issues of those who don’t like sleeping in a loft. The very roomy living area is done in a warm, light wood, which keeps the house from being dark and feeling claustrophobic. 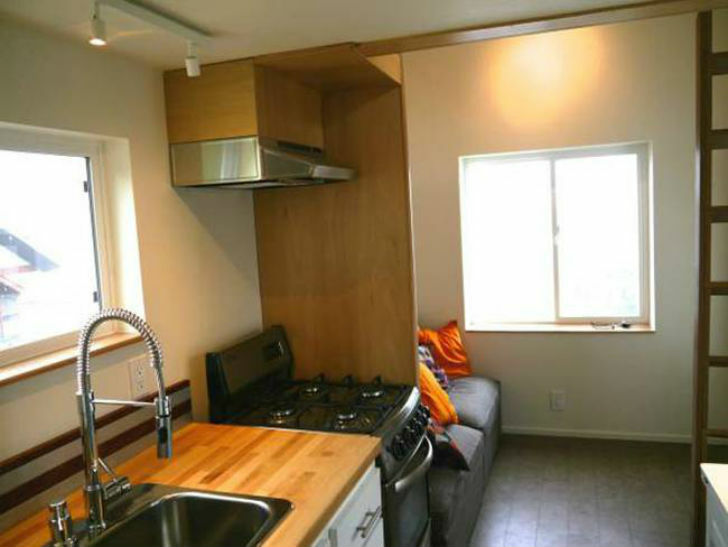 The ample kitchen has plenty of work space and full-size appliances. 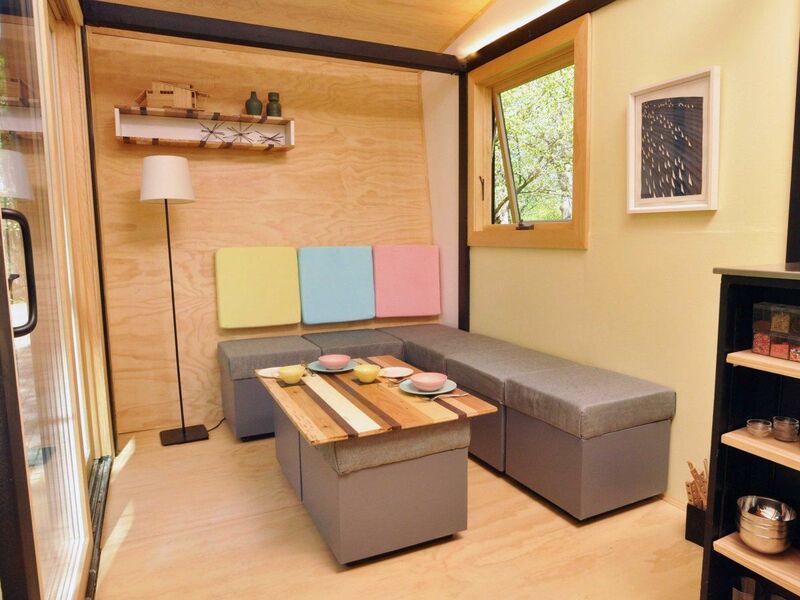 The built-in dining booth can easily accommodate four people. 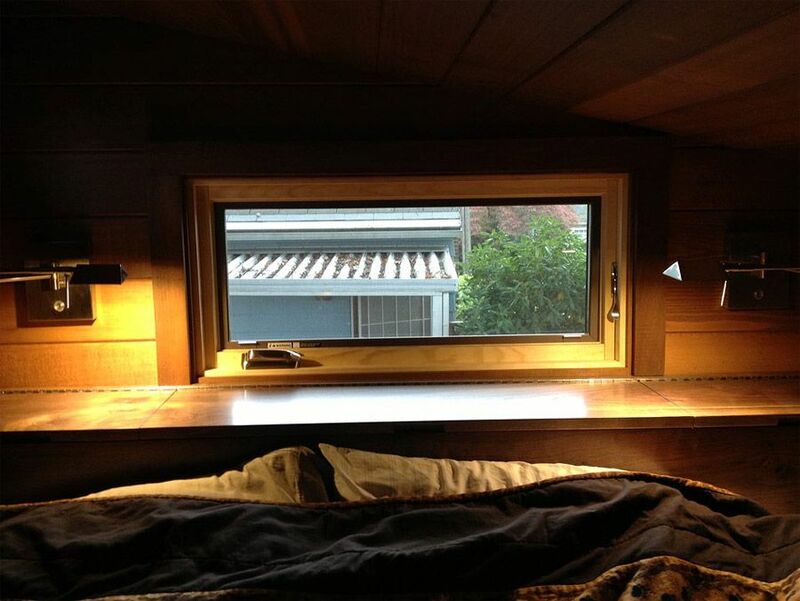 Unlike most loft arrangements, the bedroom of the converted truck can be closed off with the drapes for complete privacy. This we’d like to try! 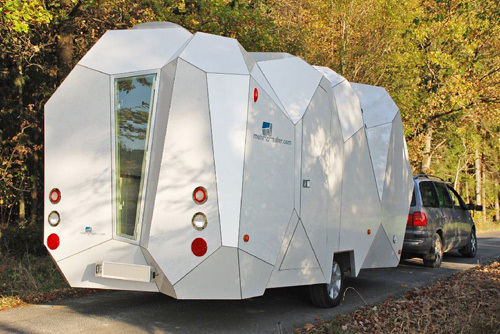 This truck-powered mobile home is really a vacation on wheels. The unusual exterior of warm wood gives it a retro feel, which carries through to the inside decor. The accent of bright blue against the rich, polished wood enhances the retro feeling. 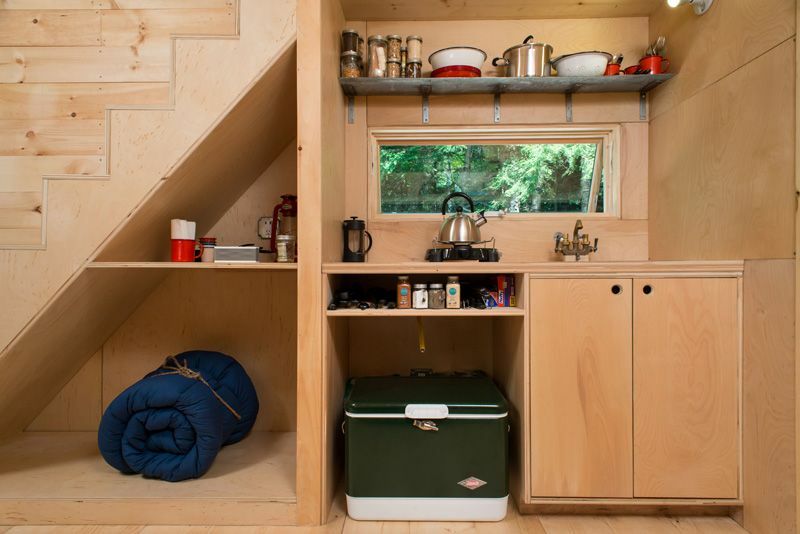 A small sleeping loft and basic kitchen complete the amenities. 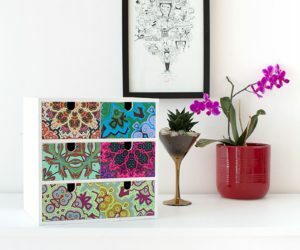 While it may not be perfect for full-time living, it’s a stylish choice for vacations on the go! 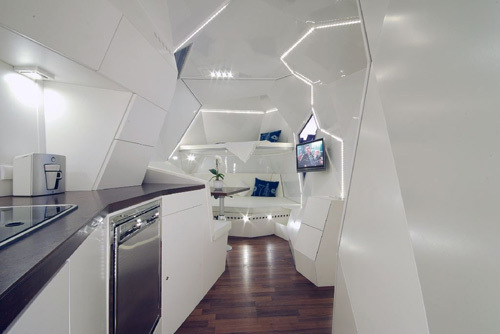 Far from rectangular, this tiny house on wheels is futuristic and angular — an attention-getter no mater where you decide to take it. On the inside, the angular, minimalist design is enhance by the modern kitchen appliances and lack of clutter. 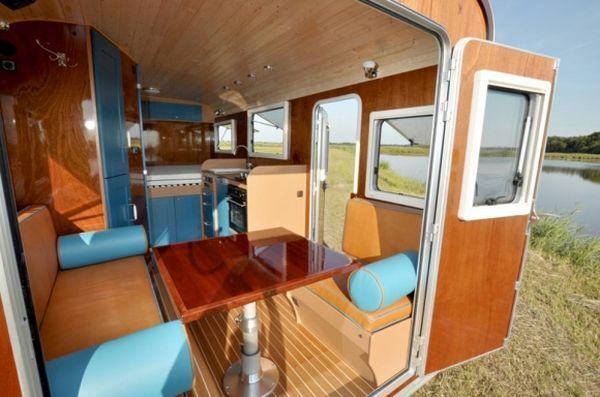 The open living space includes a built-in dining and sleep area with a bonus sleeping berth for one. 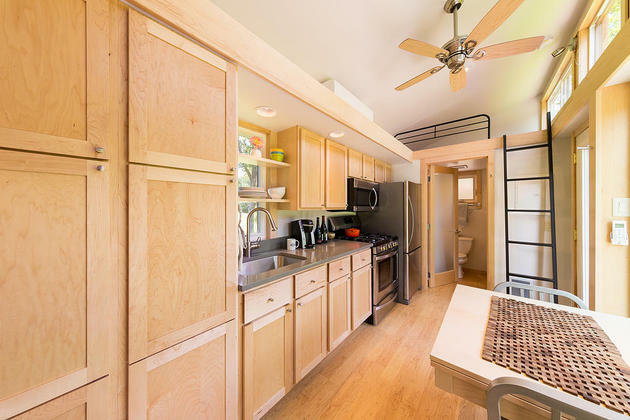 While it might be suited for full-time living, this mobile home is a perfect unit for a vacation getaway at a moment’s notice, or for glamping in style. 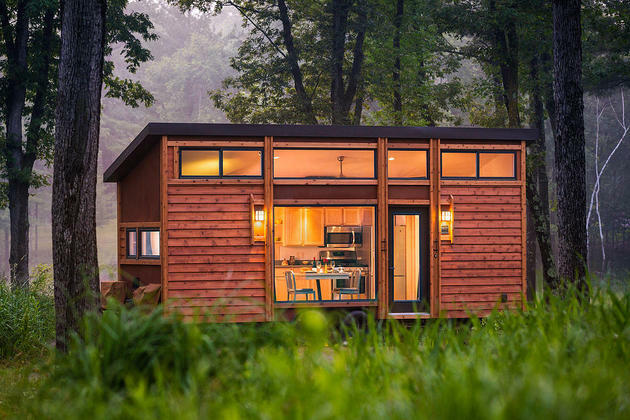 Regardless, it is also a wonderful example of how a tiny house can reflect just about any style of design, both inside and out. 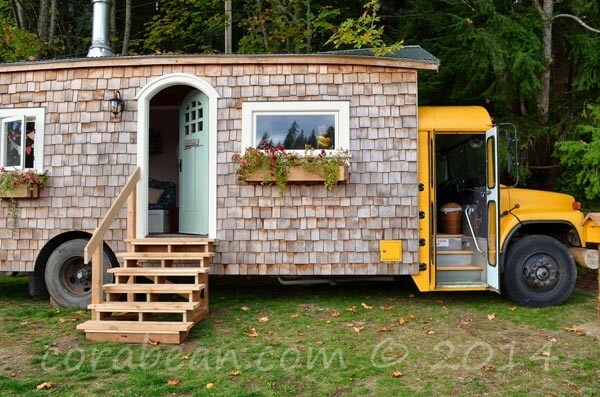 It’s hard to believe that this was once a big yellow school bus! 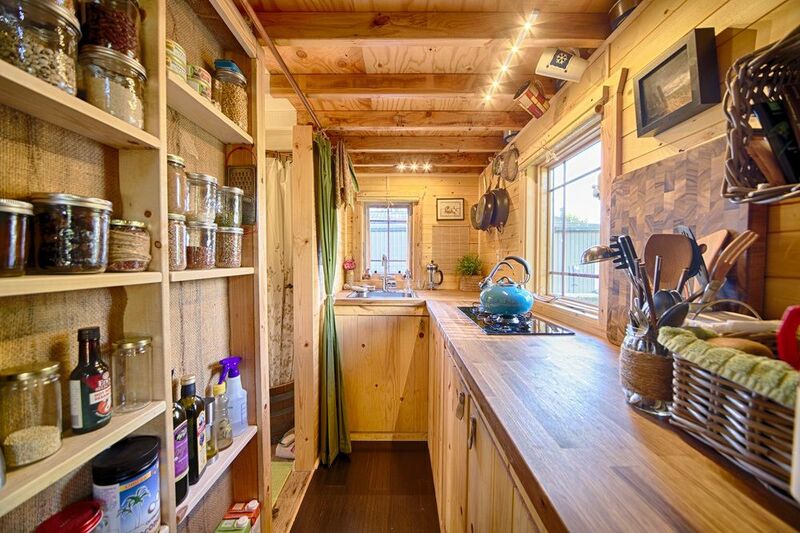 The owners of this home invested four years of sweat equity in building out this tiny house on wheels and used lots of salvage materials in the process. Inside, the decor is equally charming, from the old-fashioned wood stove and tin wall, to the wainscot walls and rounded doorway that mimics the rounded ends of the building. The main bed is inside an alcove that has a moroccan-style shaped entry and the space above it is more living space that can also sleep more people if necessary. The kitchen and bathroom are fully equipped and exude the same charm. 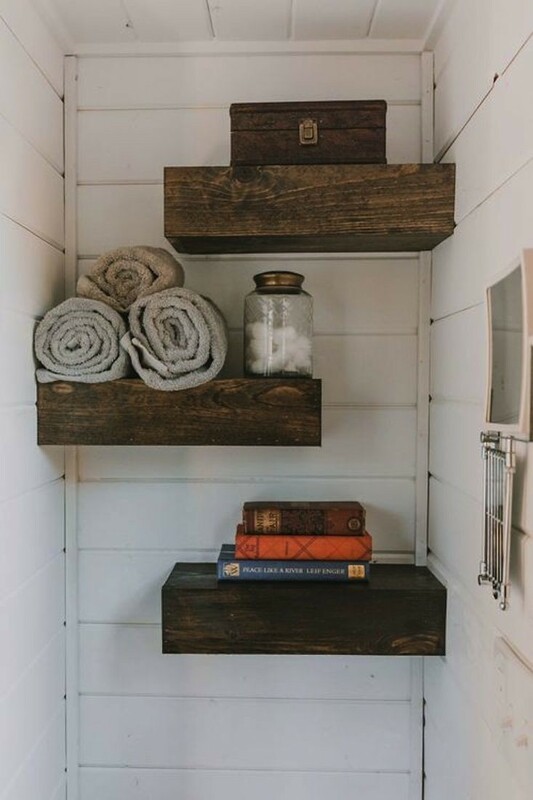 Storage abounds as do windows of every shape and size. 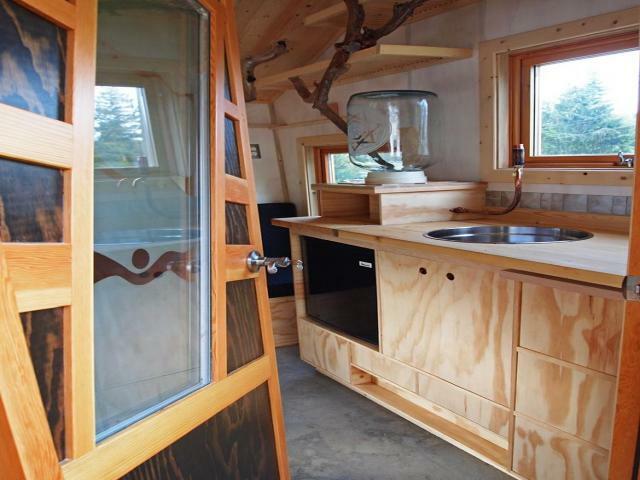 This is a truly amazing transformation form a run-of-the-mill bus to a one-of-a-kind home. 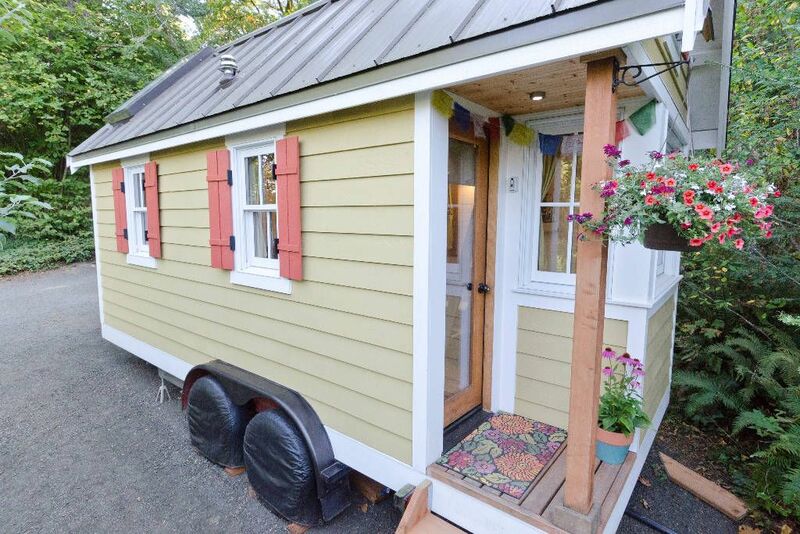 As with traditional homes, there are as many styles of tiny houses on wheels as there are homeowners. 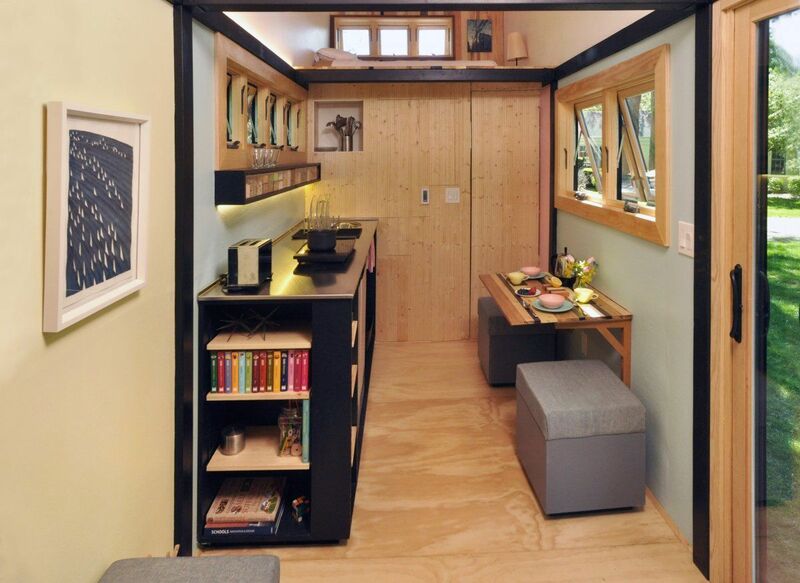 If you decide to go the micro home route, there’s a way to accommodate your specific needs and desires. 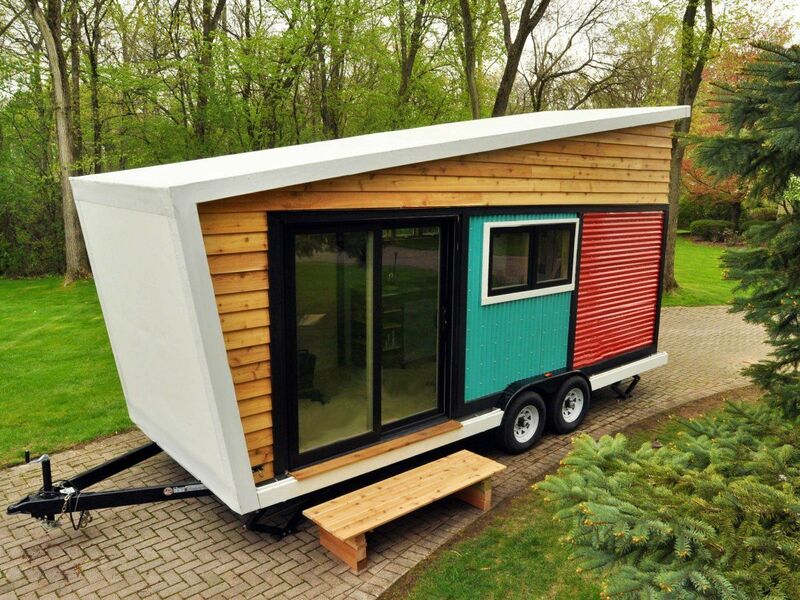 Have a tiny house on wheels? Share it with our audience!